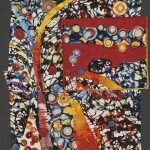 ﻿ Artsi Fartsi Triscartsi | Welcome to my Artsi Fartsi World! 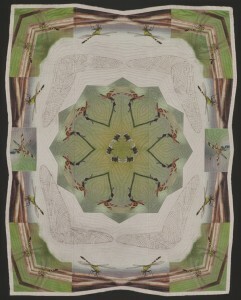 Welcome to my Artsi Fartsi World! 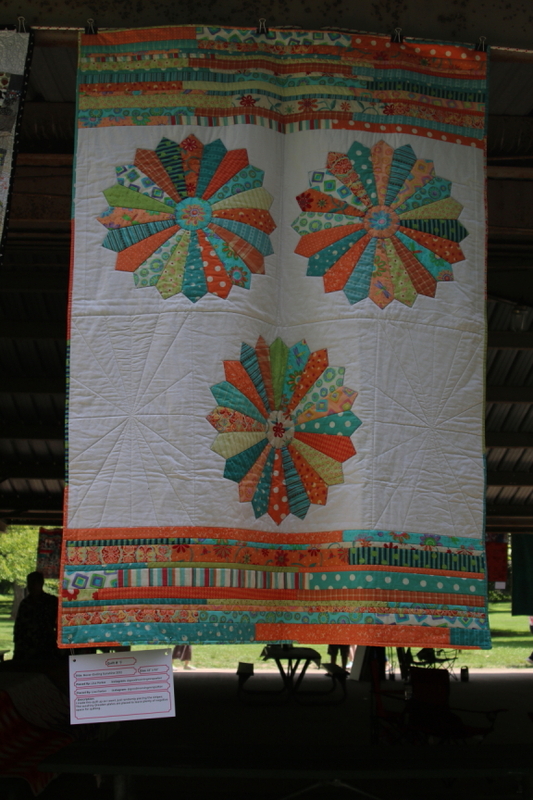 I spent an hour this afternoon at the Indianapolis Modern Quilt Guild’s Quilt show in Broadripple Park. 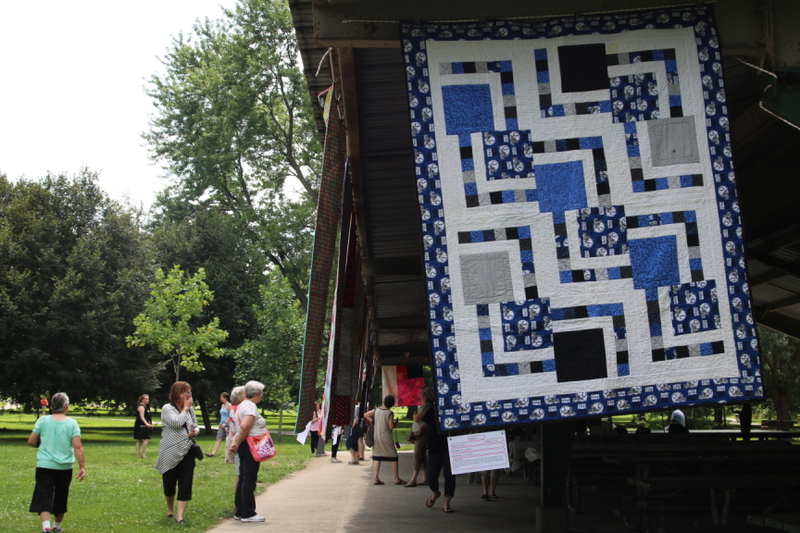 It was a lovely outdoor show full of wonderful quilts at a picnic shelter. 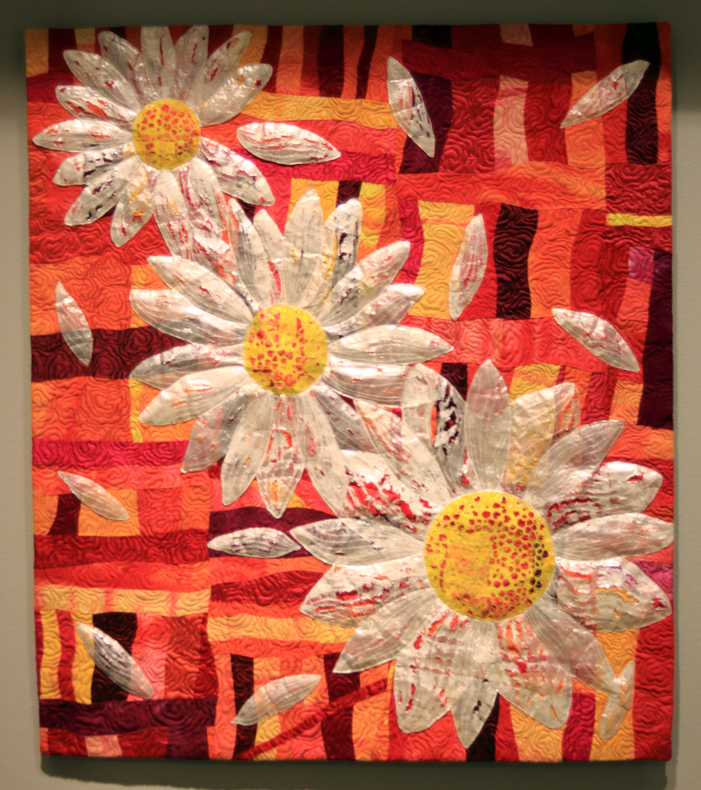 I blogged about the show on the Quilter’s Guild of Indianapolis’ website here. 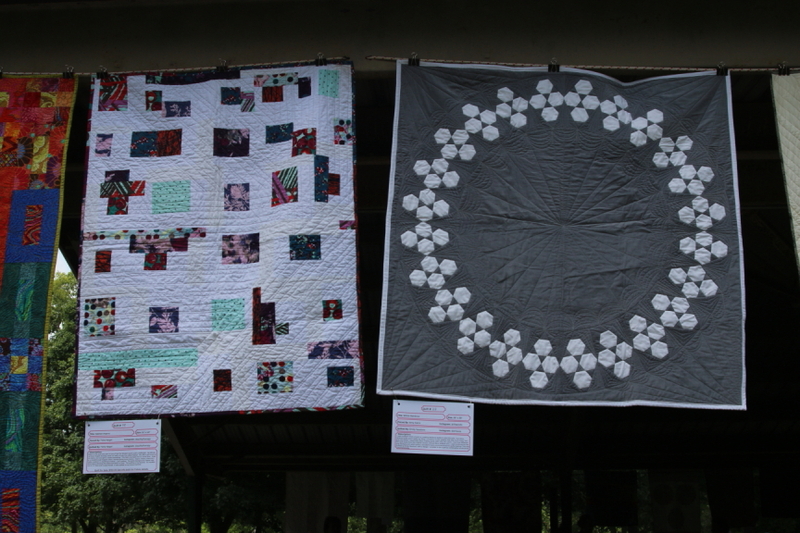 You can visit there for more general photos of groupings of quilts and those laying on tables under the shelter. 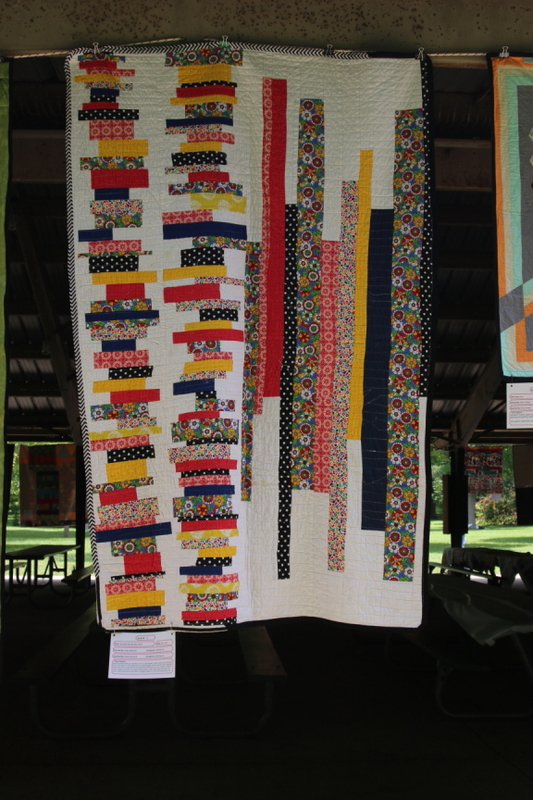 Below you can see a slideshow of most of the individual quilts hanging in the show. 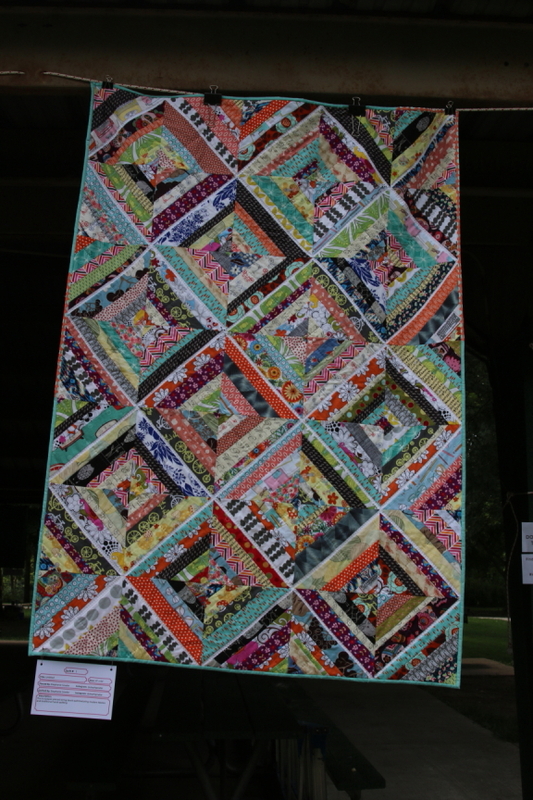 The IMQG is a talented and fun bunch of quilters! 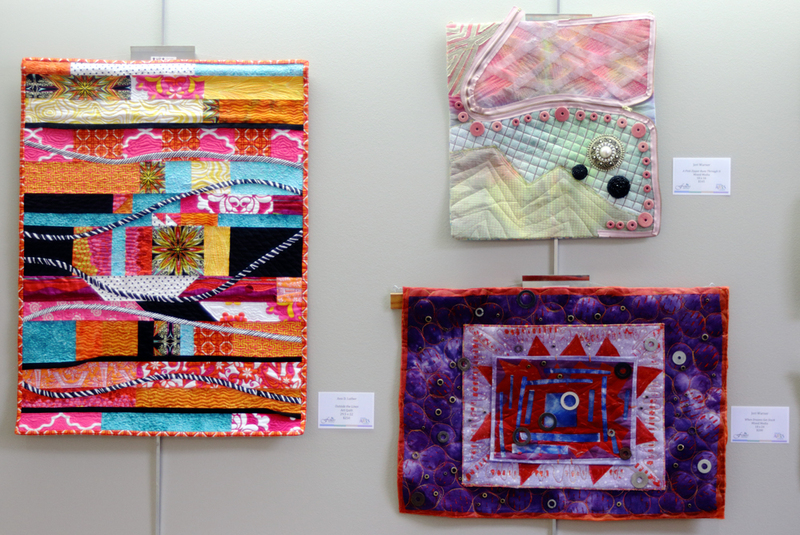 The Indiana chapter of Studio Art Quilt Associates (SAQA) held a call for entry under curator and SAQA IN Representative, Kate Lenkowski. 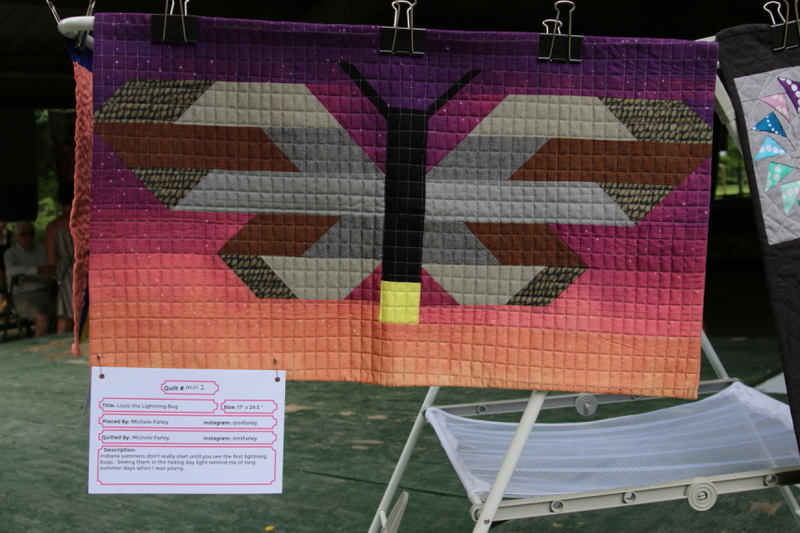 Entrants were from Indiana and a few surrounding states. 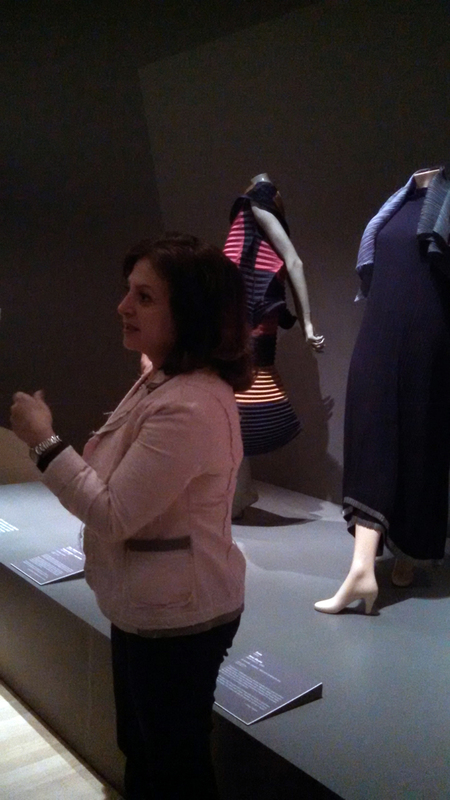 Niloo Paydar, the Textiles and Fashion Arts Curator at The Indianapolis Museum of Art, juried and advocated for the exhibit at the Indianapolis Museum of Art (IMA). 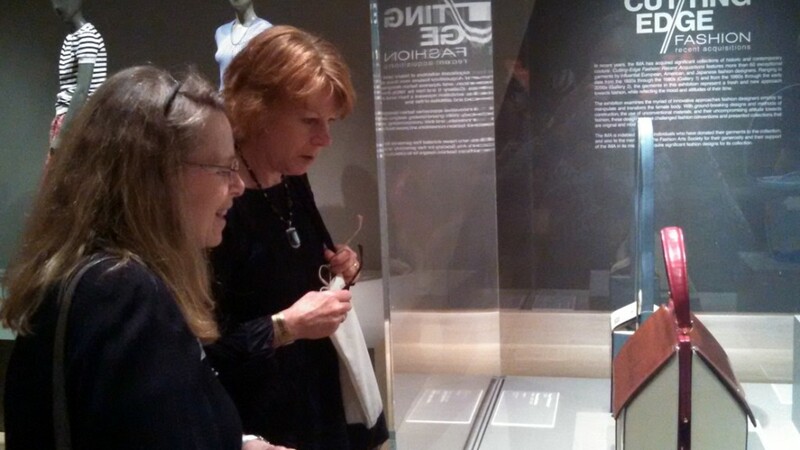 I am very grateful for the efforts of these two women for making this exhibit happen. 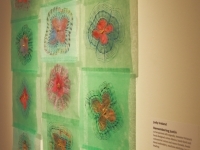 Kate Lenkowski and Daren Redman had a vision for this exhibit and approached Niloo Paydar and pitched her their vision. Thankfully Niloo embraced the vision and put the proposal forth to the IMA and secured approval. 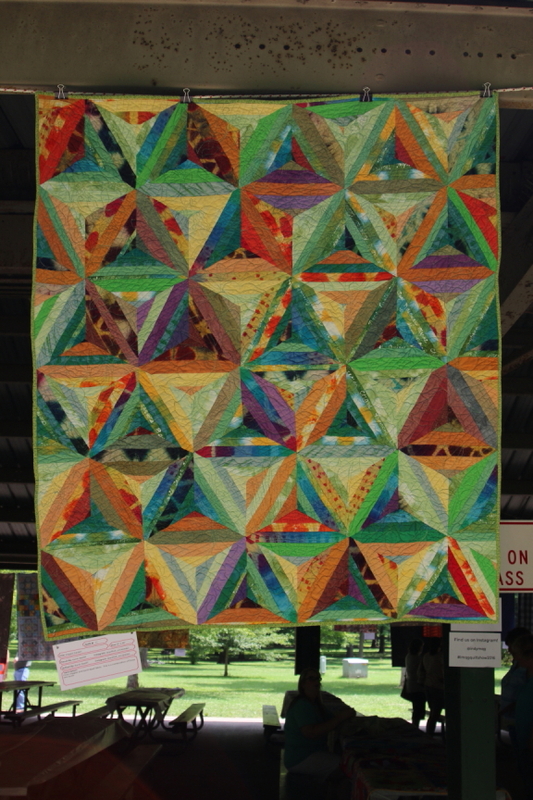 There have been countless debates over the art verses craft of quilts. 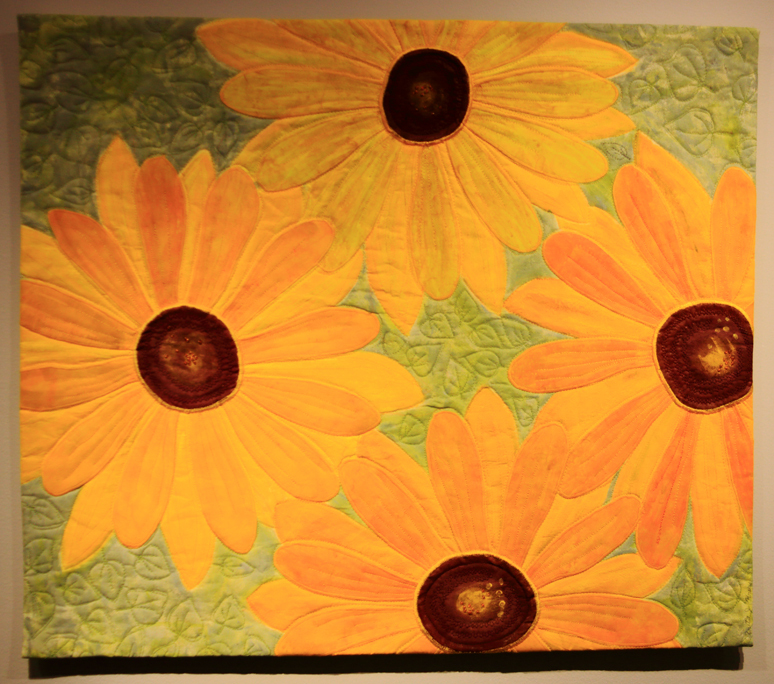 I definitely come down on the side that art quilts ARE art. 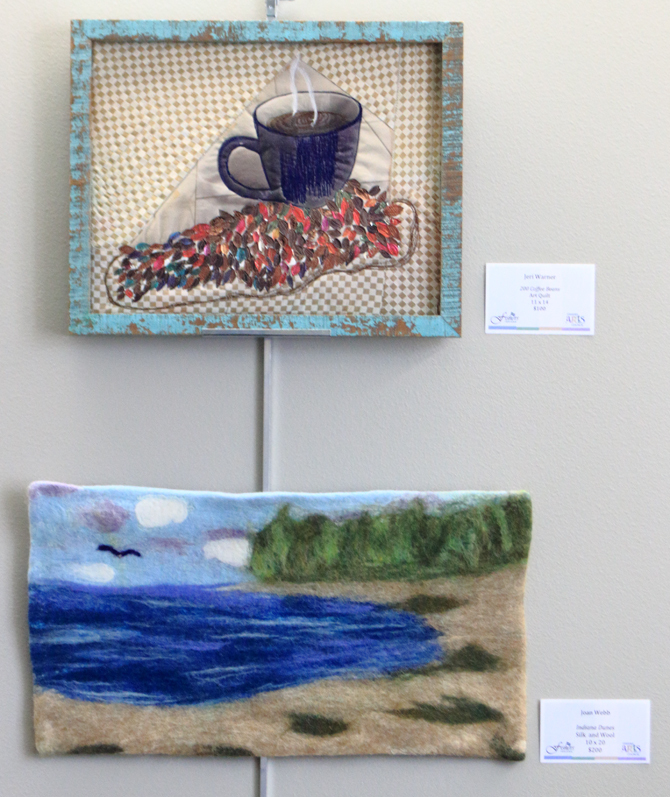 They are pieces of art using fiber as the medium. 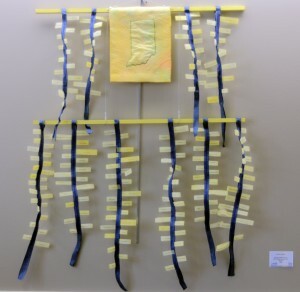 Artists, such as myself, study design and art principles and utilize and analyze them during the making of their art pieces. 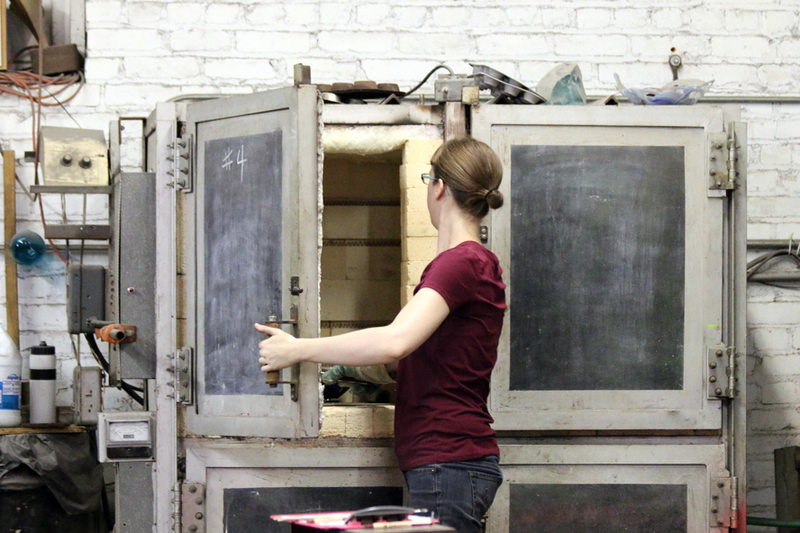 They are generally not utilitarian crafts, but made and presented as pieces of art. I digress on this topic for a purpose. 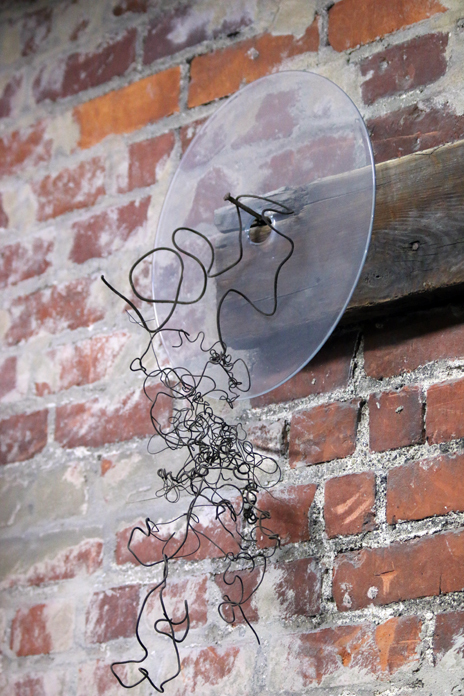 It can be difficult to get exhibition space due to this issue. Museums and galleries limit the number of art quilt exhibits. 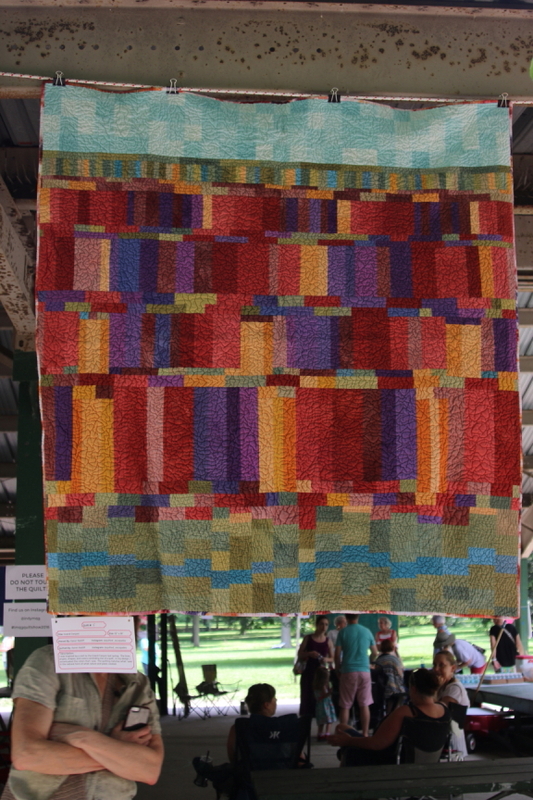 I heard back from a gallery space saying that they had already exhibited quilts and felt that two quilt exhibits in two years would be too many. Would they have said that about two watercolor exhibits? 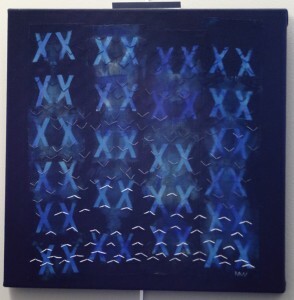 Two oil painting exhibits? 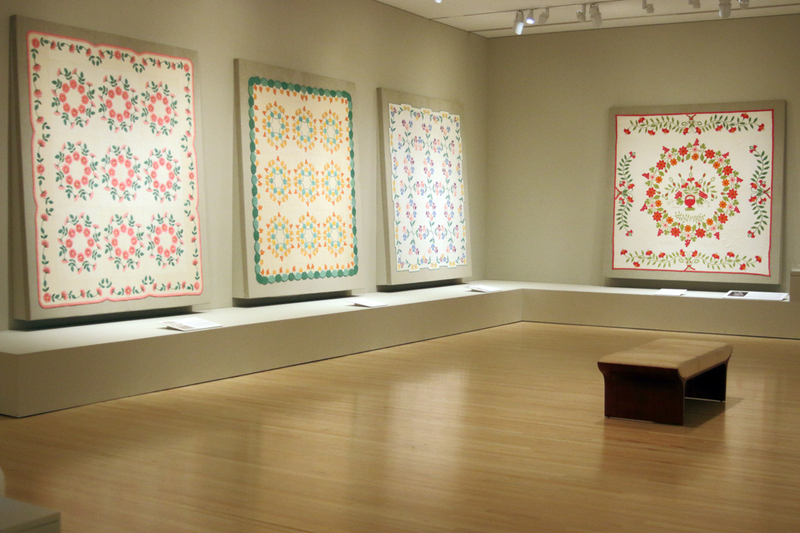 The acceptance of art quilts by museums, galleries, and art academics has been an ongoing struggle since at least the 1970s. 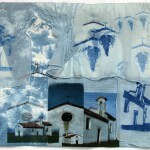 I am very grateful to those who have been persistently working toward respect for cloth as a valid art medium. 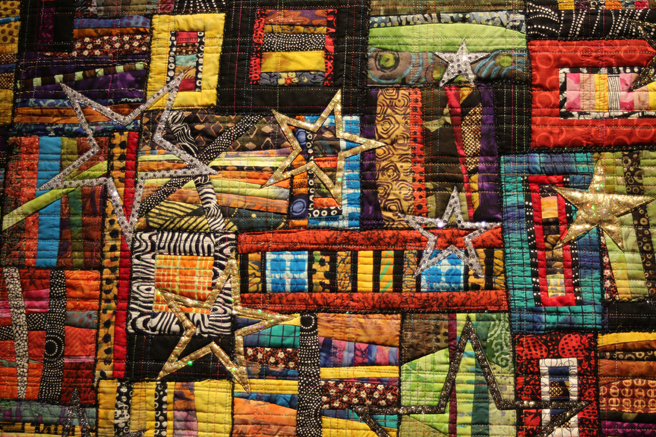 SAQA, and it’s founder, Yvonne Porcella who passed recently, have been integral in this movement toward expanding the value of art quilts in the art world. 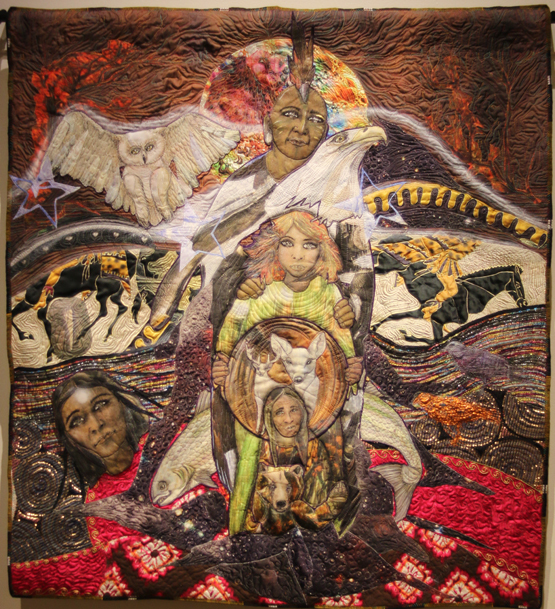 There are now museums specific to fiber arts and quilts, due in a great part, to the popularity of quilting and the continued efforts to show this art to a broader audience. This exhibit may be ground breaking. 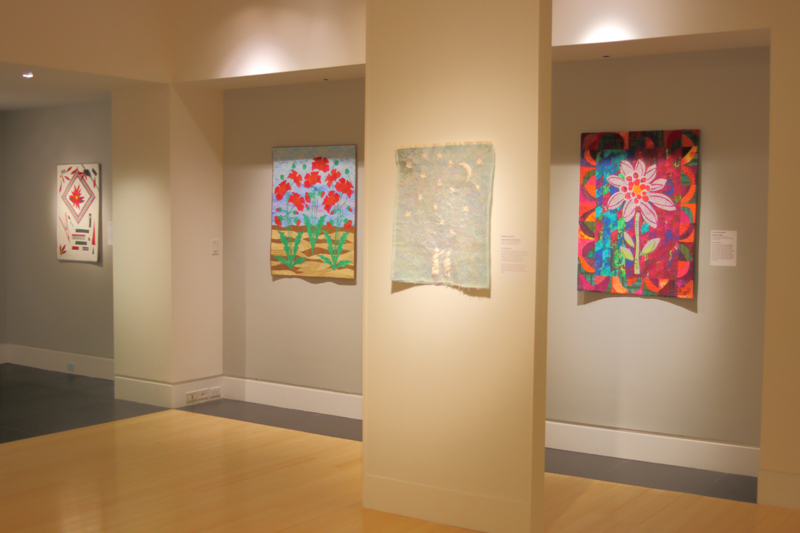 I wonder if anyone knows of another art museum that has had two simultaneous quilt exhibits. 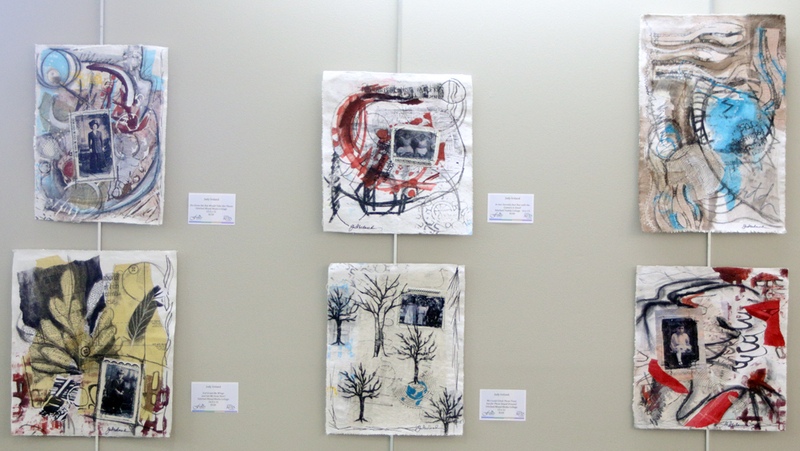 I thank Niloo Paydar for her efforts to make this exhibit a reality. 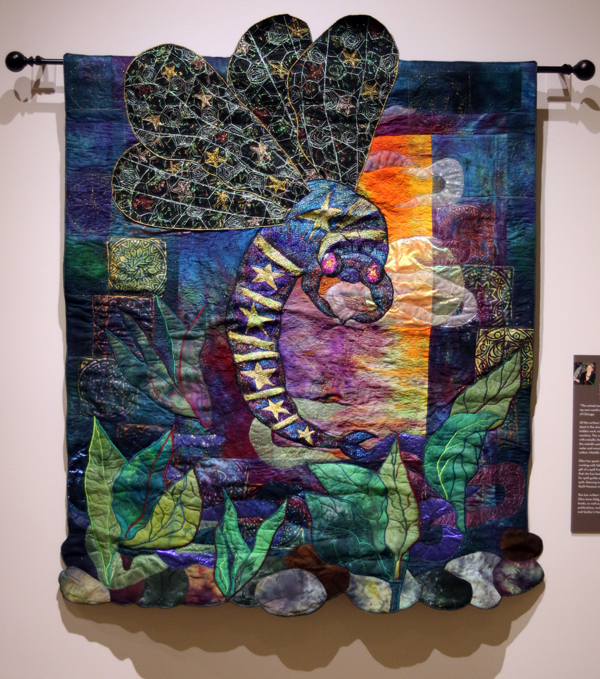 I hope that we artists did not disappoint her in our resulting pieces for the call and that the IMA gets good feedback on the dual exhibit so that they will expand their exhibiting of art quilts in the future, while modeling the value of quilt art for other museums and galleries. 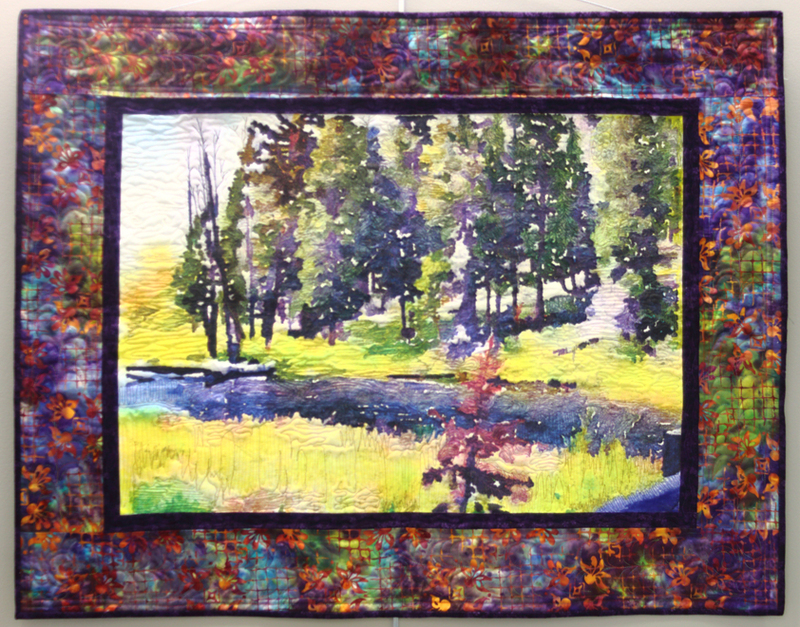 I attended the opening evening’s artist panel where the topic: When Artists Step Out of Their Comfort Zone was very interesting given that our pieces were to be artist responses to the quilts and body of work of Marie Webster. 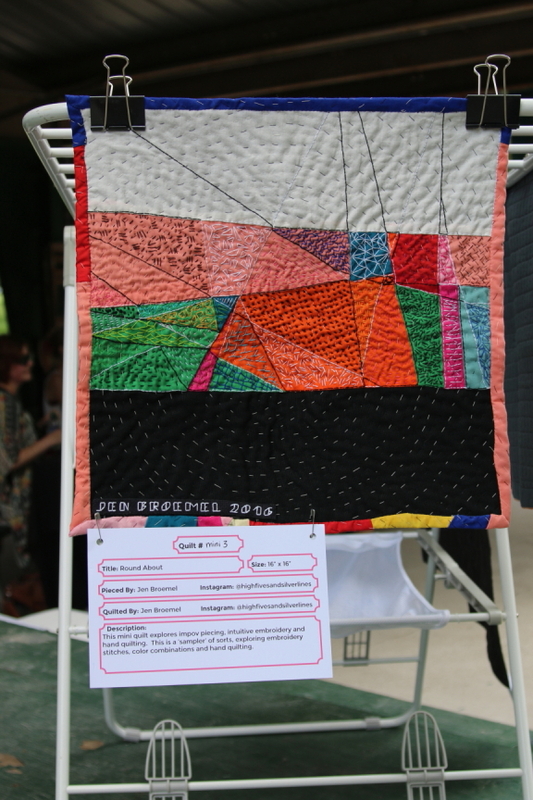 Drawing inspiration to make an art quilt based on something so removed from contemporary art quilts was a challenge for many of us and it was interesting to hear how four of the exhibiting artists dealt with this disparity. 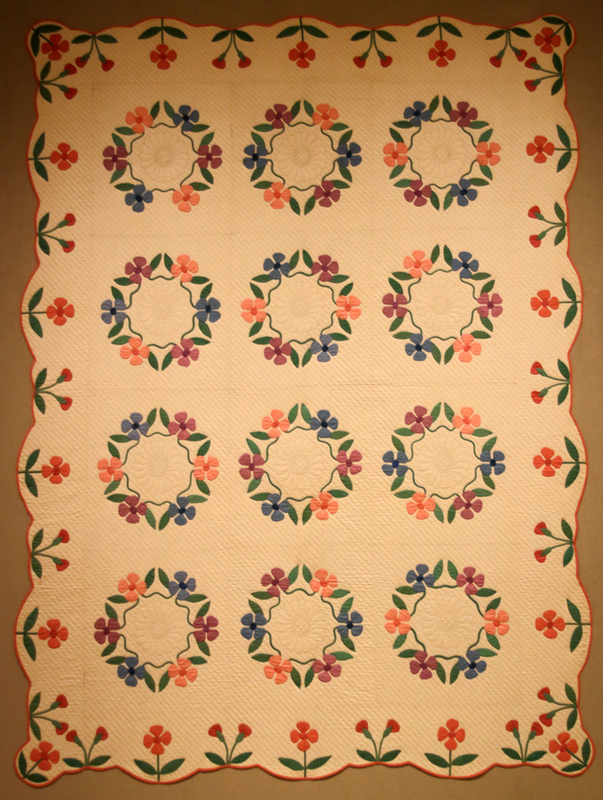 An album of some quilts from the Marie Webster exhibit are at the bottom of the page. The panel was comprised of two Indiana artists, Pamela Burns and Terry Pate, and two regional artists, Barbara Schneider and Kathleen Loomis. 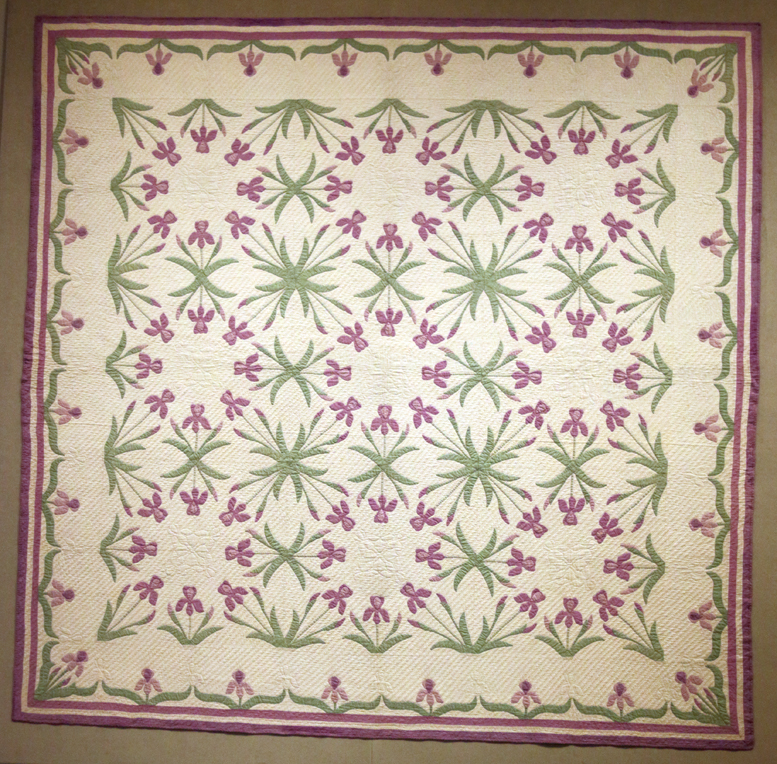 Marie was a Hoosier quilter in the early 1900s. 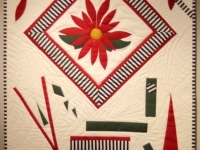 While today her quilts seem very traditional, back in her time they were cutting edge. 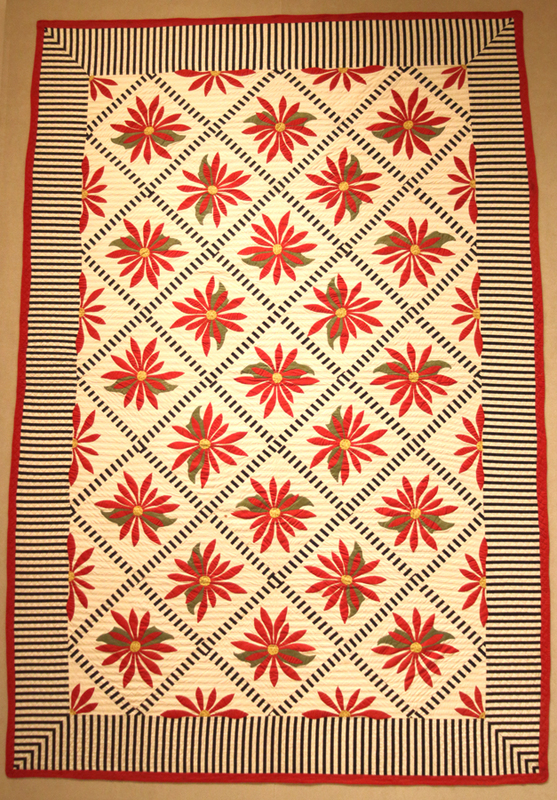 Her quilts and their patterns were published and sought after. She became an entrepreneur in a time when it was unusual for married women to work, let alone be an entrepreneur. 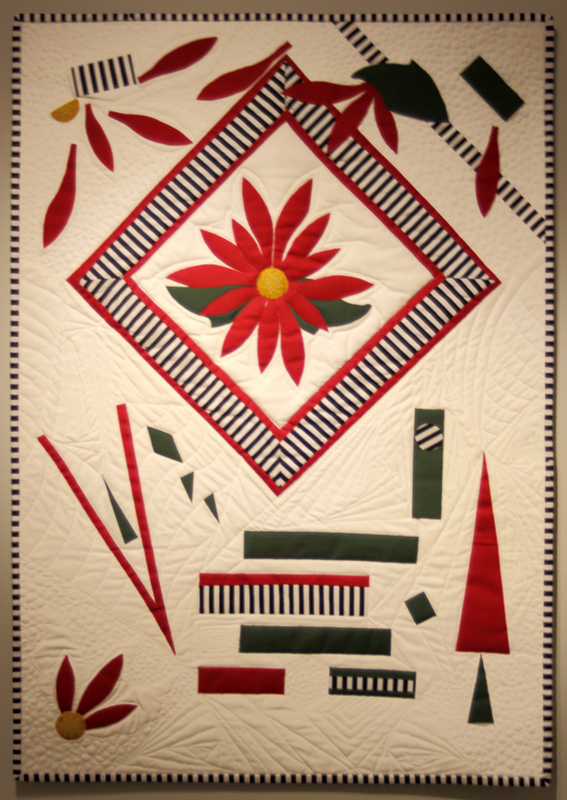 She published the first book on quilting. 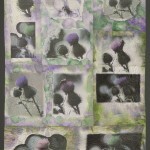 I did not know much of anything about Marie Webster before I began and did research into her and her work because the pieces were to be “dialogues” with Marie. 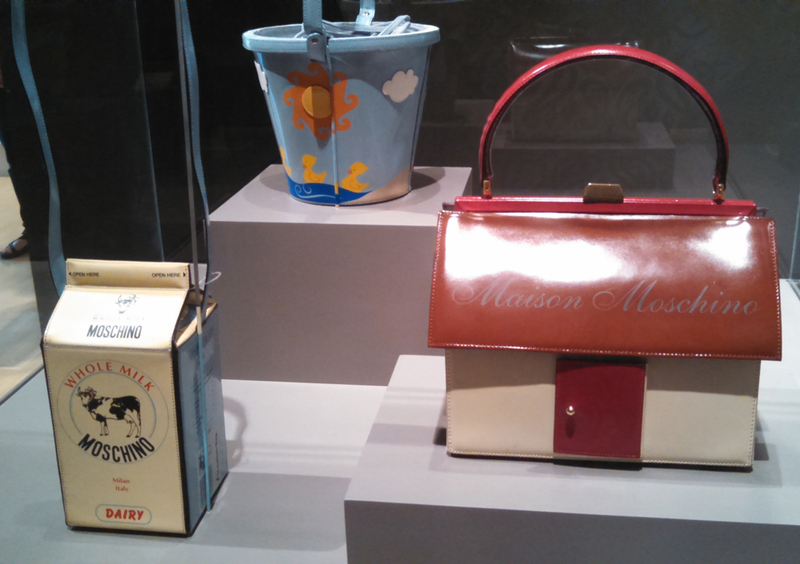 I will expand on my journey for this exhibit in a future blog. 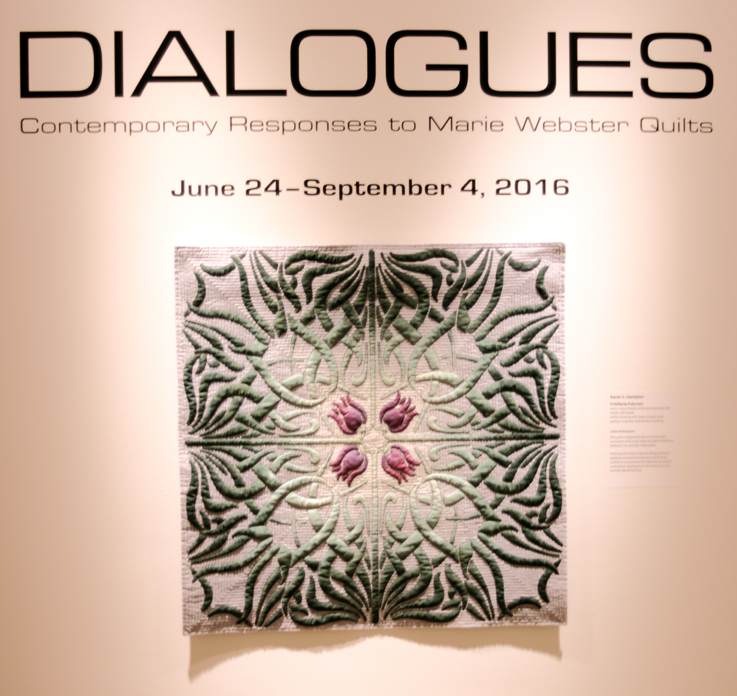 For brevity on this post, suffice it to say, I did enjoy my “dialogue” with Marie and am grateful for this exhibit for all I learned about Marie Webster, her work, and her process. 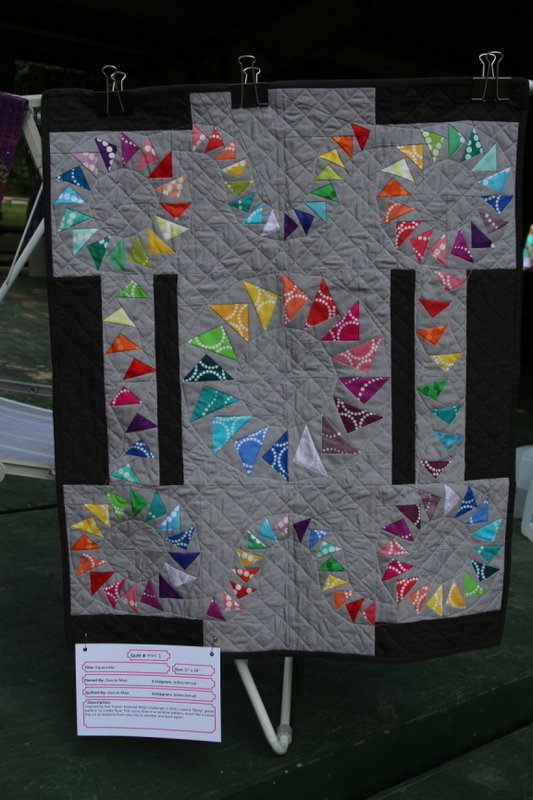 My quilt Dragonflies (submission photo). 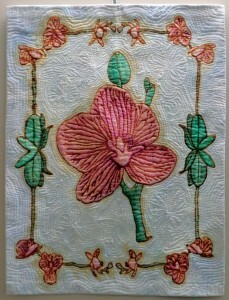 The dragonfly wings in the white border are quilted in metallic threads that is also surrounding each dragonfly. 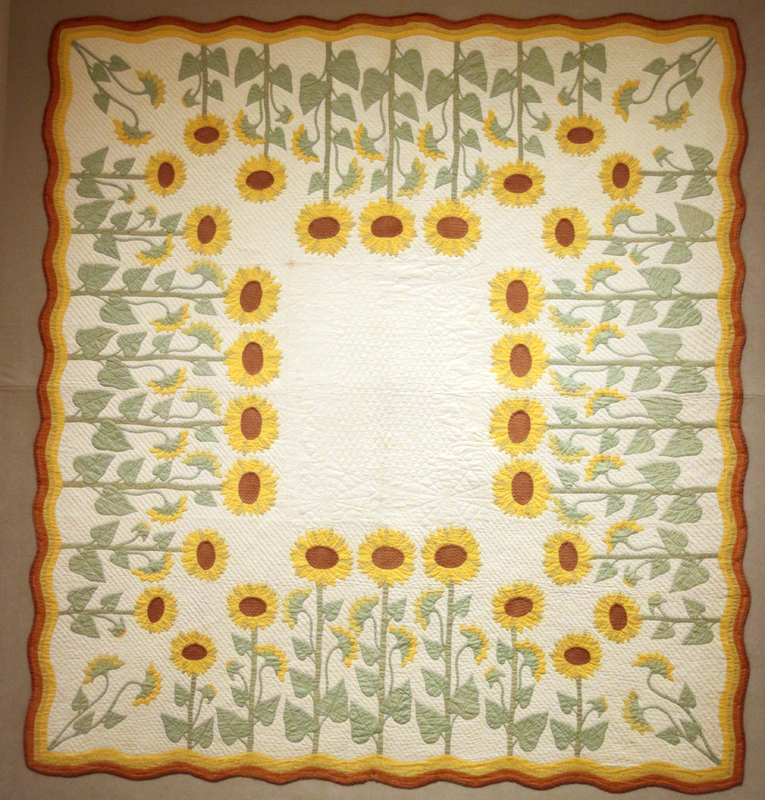 There were so many beautiful quilts in the exhibit, I decided to give myself some guidelines in selecting which pieces to post here. 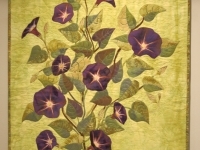 Just like any jurying process, that does not mean there were not many other equally beautiful pieces I could have chosen. 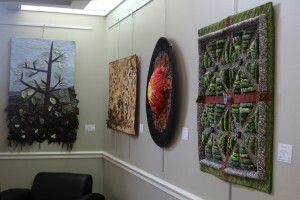 I decided to choose some overall photos of the gallery and quilts from Hoosier quilters whom I know. 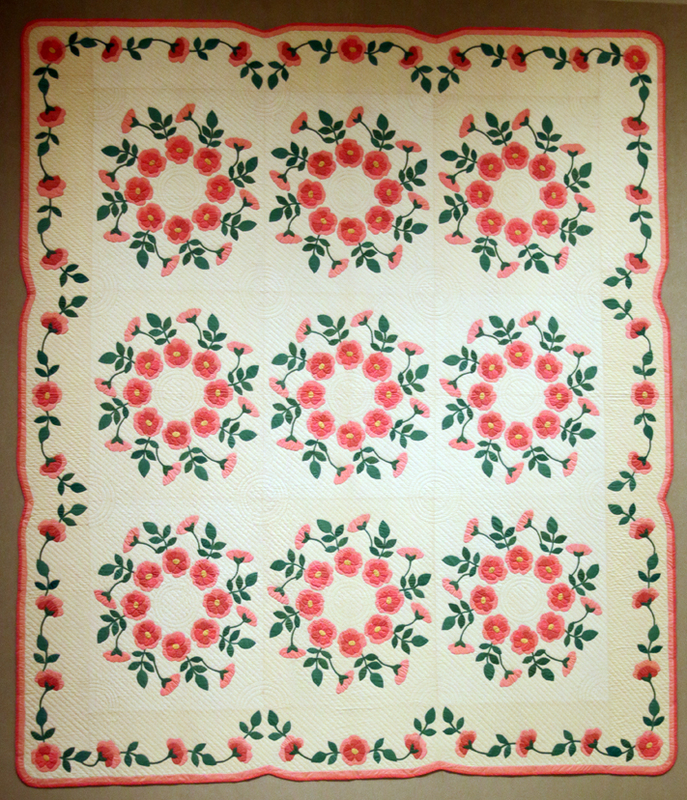 I will say, that due to the fact that most of Marie Webster’s quilts are floral, so are the responses. 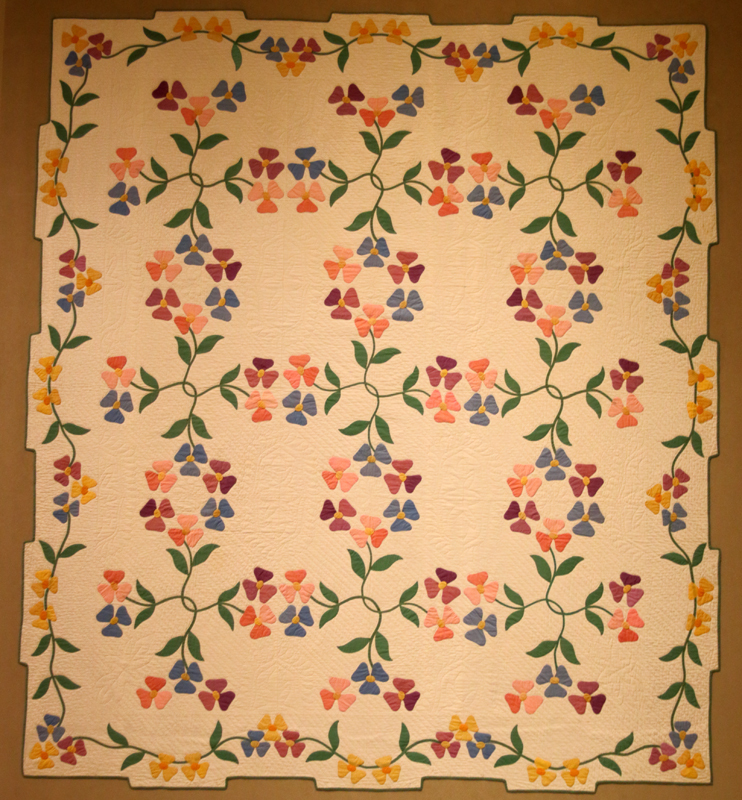 There are only two quilts that do not have flowers: mine and Kathleen Loomis’ (seen above on the pilar in the second gallery photo). 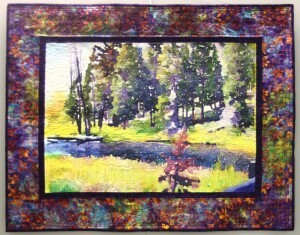 Mine is below, but I chose to use my submission image since it is a better photograph than I was able to take in the gallery. 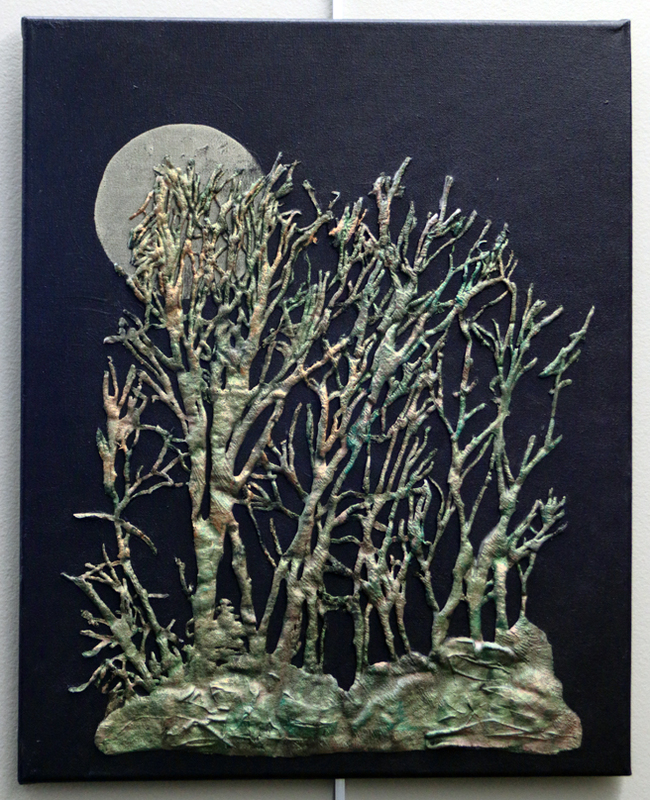 I also include the submission photo of Sonia Martin’s piece since I took that for her and the natural lighting is better for photography. 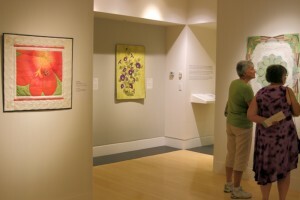 At the bottom of the page is a slideshow of some of the quilts in the Marie Webster exhibit at the Indianapolis Museum of Art. 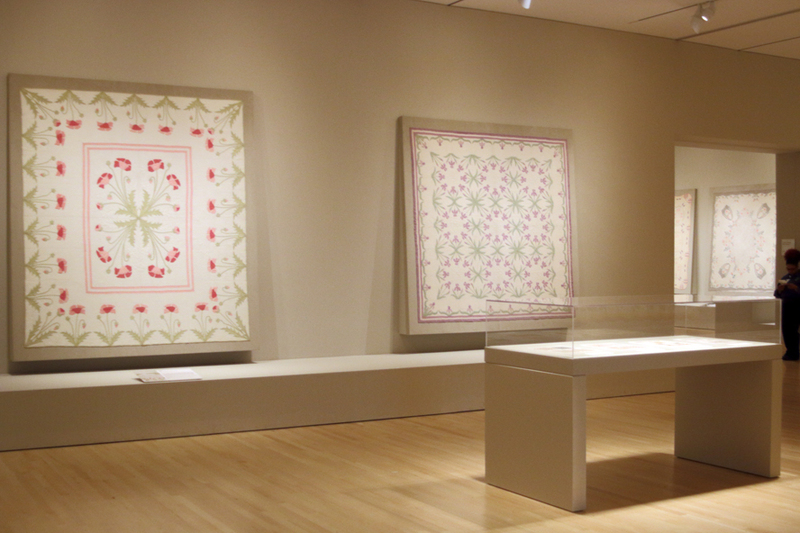 The lighting is low to protect the quilts as much as possible during the exhibit. 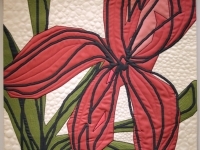 They are also on angle for less stress on the fibers. 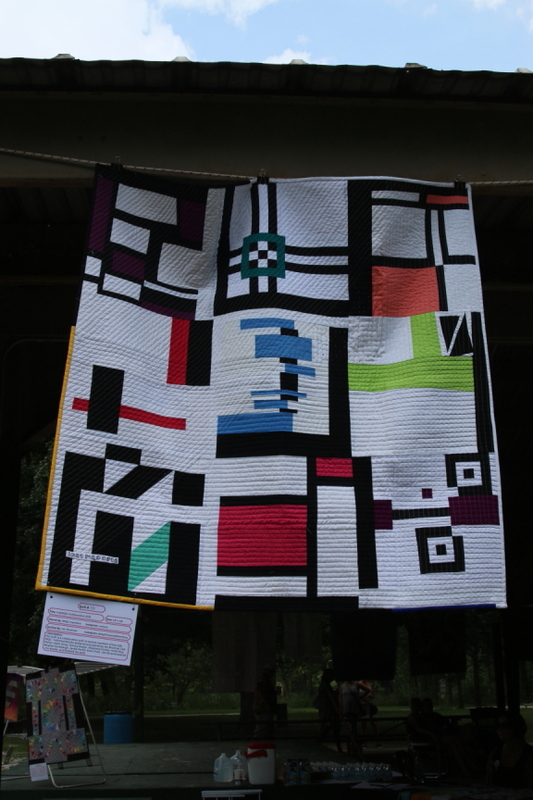 So, it does not provide the best possible scenario for photographing the quilts. 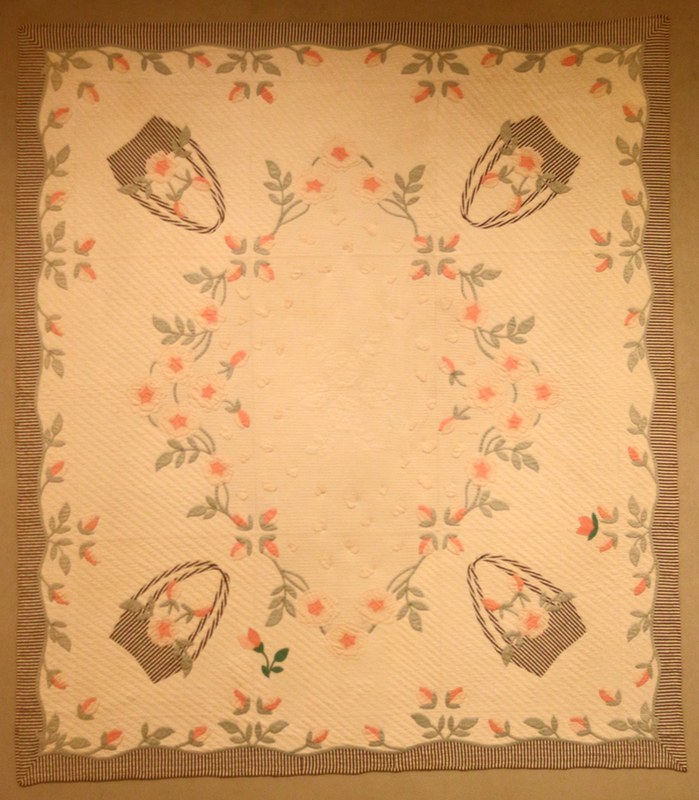 The quilts are pastels in general and I adjusted the photographs. 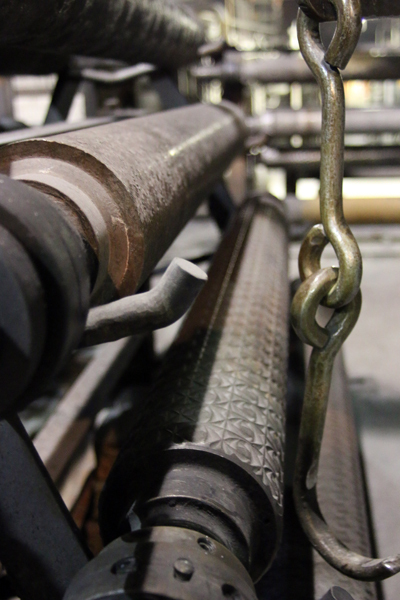 During adjustments, they either turn out too bright or still too dim. 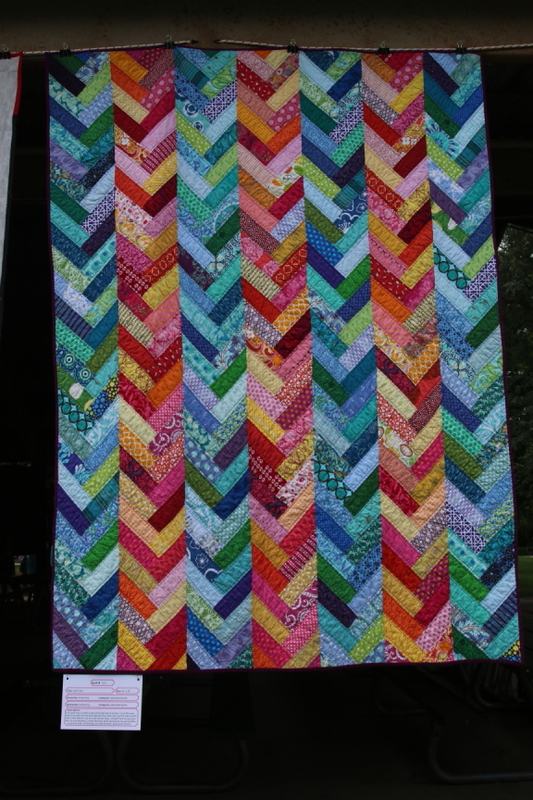 I over adjusted some and under adjusted others to give you more of an idea range of color. The truth lies in between. 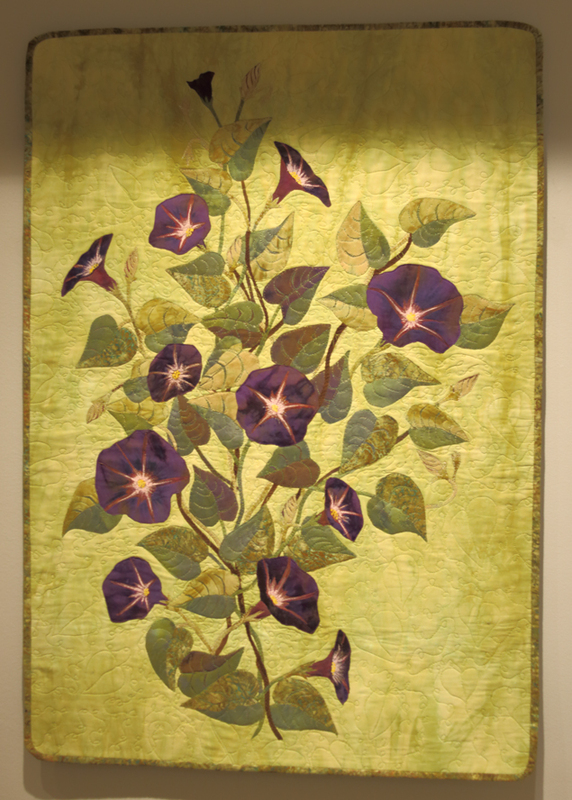 Since I brought up lighting issues with quilts, I also ran into lighting issues with the SAQA exhibit. 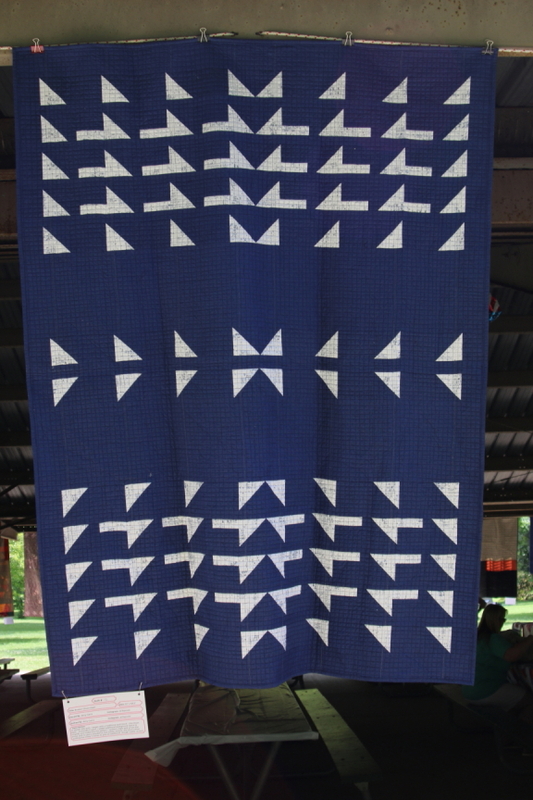 You don’t want bright continuous light on a quilt because light fades fabric. 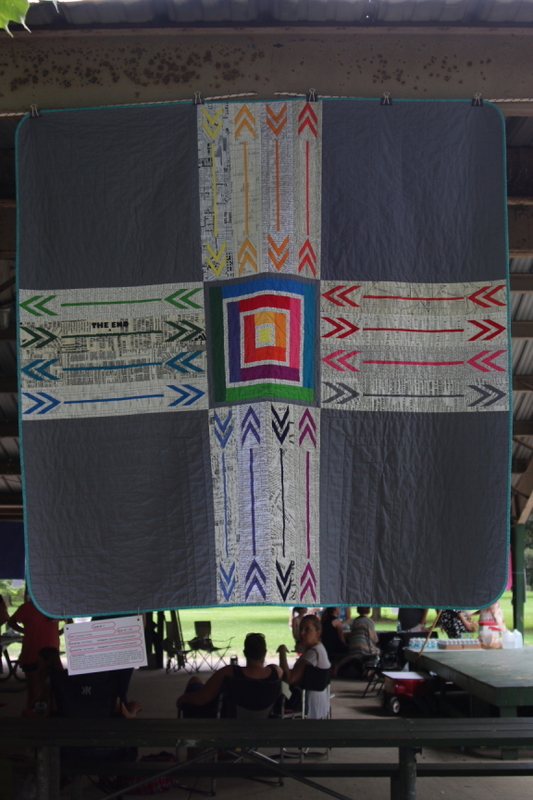 The quilts were tricky to photograph and adjust as well. 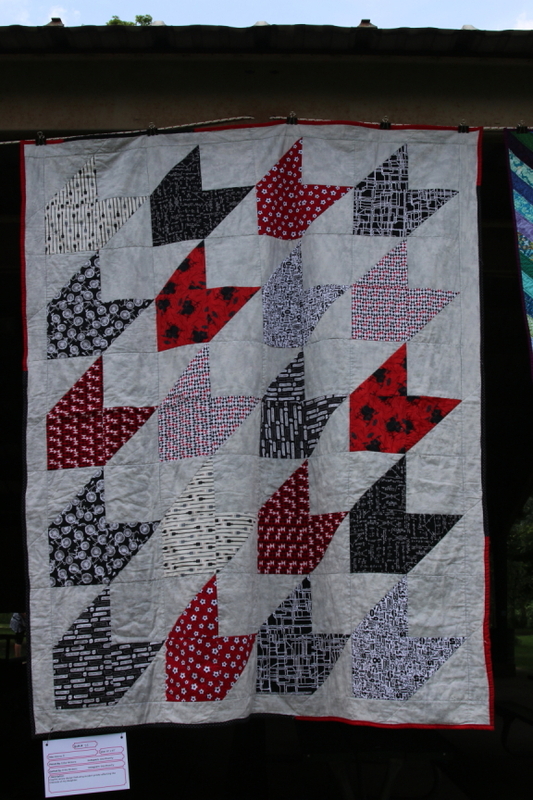 You don’t want to use flashes with quilts on exhibit which would have helped even out the lighting on the quilts, but adds to the light exposure to the fabrics. I almost always have my cameras set to no flash since I am often photographing where there is no flash or flash is distracting to others. 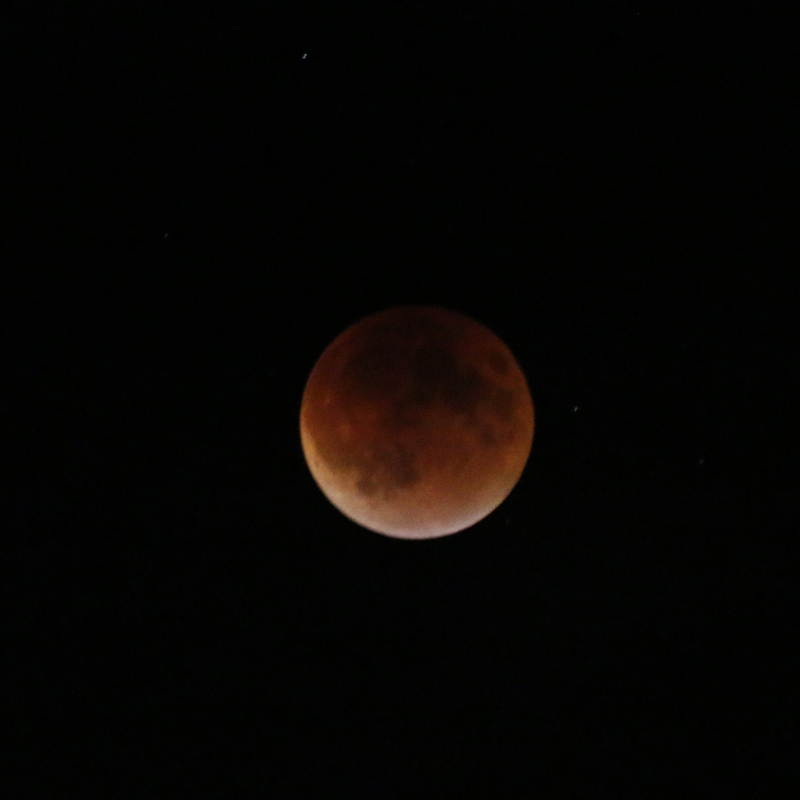 I wanted to show the difference in the pictures with straight from the camera and adjusted in software. 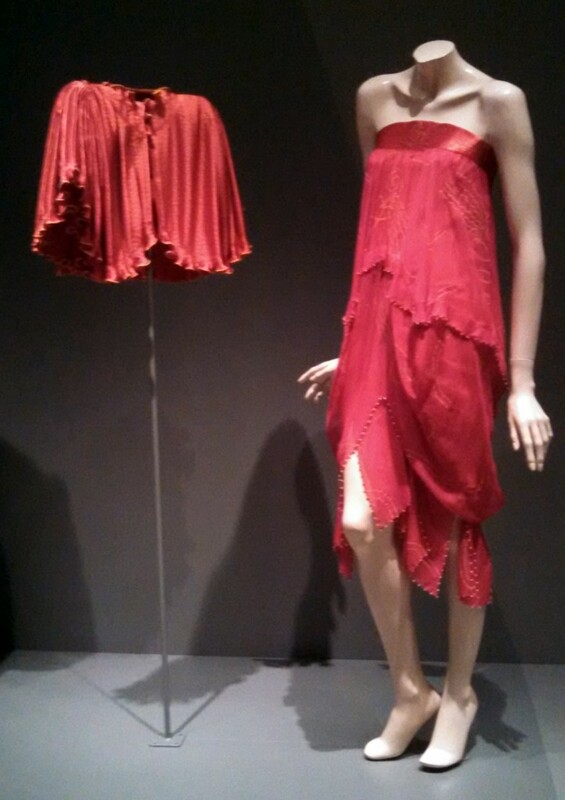 This doesn’t truly represent the light level in the room (it isn’t dark in the room), but does show that it is difficult for a camera to photograph without flash in a low light indoor situation intended to lessen the light exposure to textiles in an exhibit. 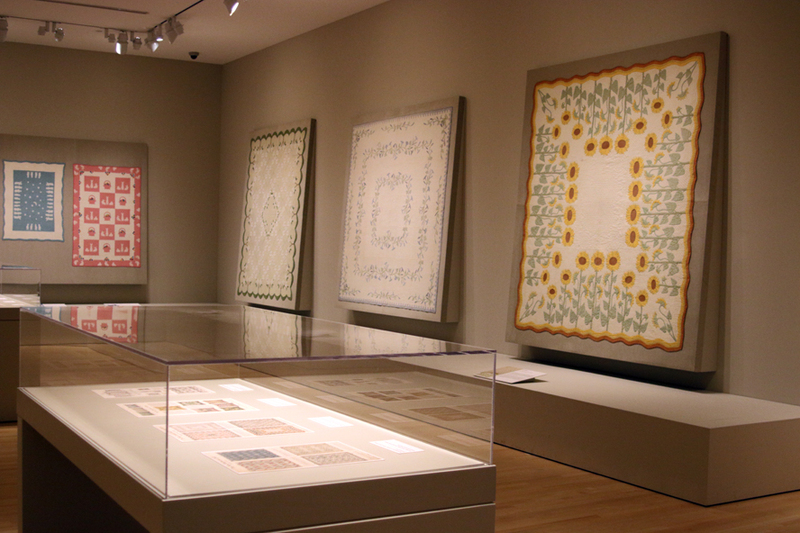 The Marie Webster exhibit has a very serene feel with the big pastel antique quilts. 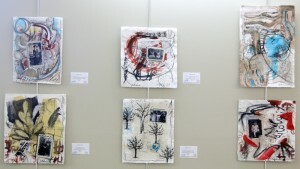 It was curated and presented beautifully by Niloo Paydar. 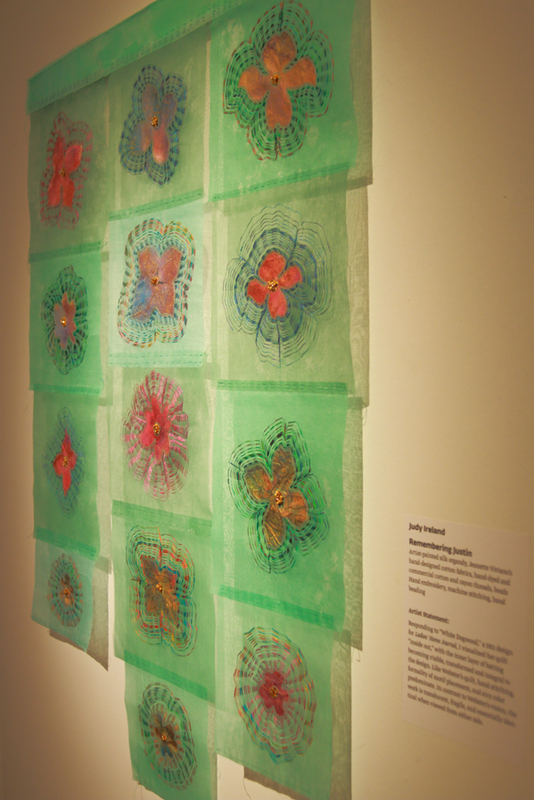 I felt joy in their beauty and calm in their presentation. I hope you have a chance to visit both exhibits. 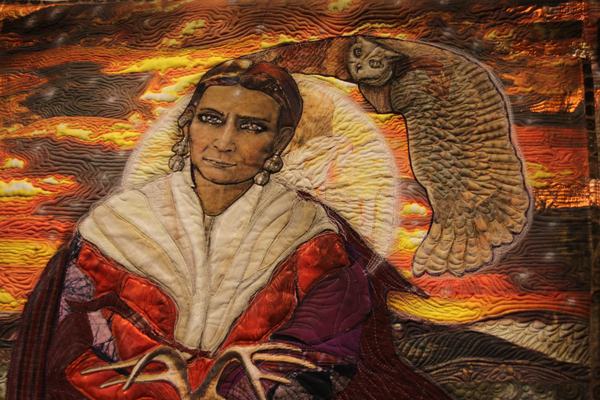 The SAQA Dialogues exhibit closes Sept 4th 2016 and the Marie Webster exhibit closes January 7 2017. More information can be found at the IMAs website. INfiber, an Indianapolis area fiber arts group of which I’m a member, is holding an exhibit at Fishers City Hall. The exhibit area is spacious to allow the group to put several pieces from each member. 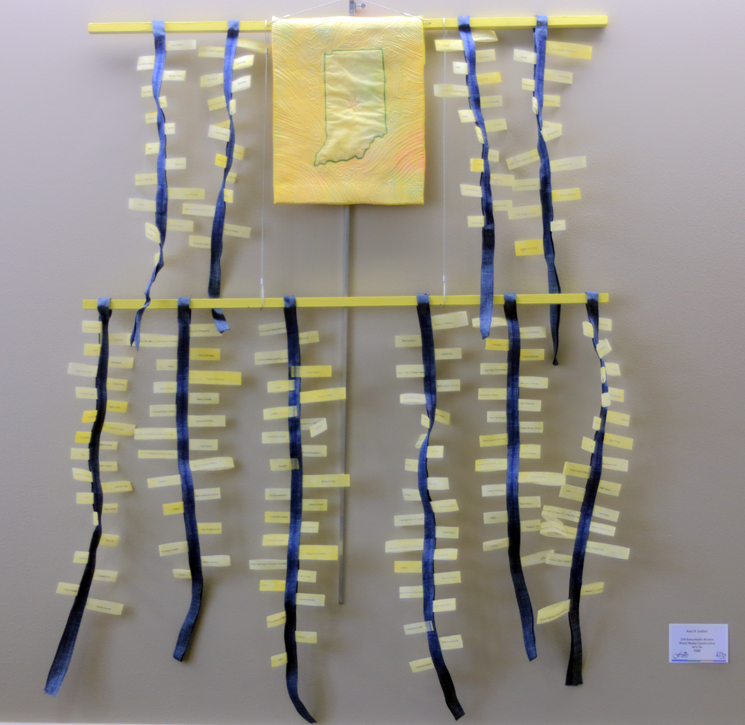 Members did pieces specific for Indiana’s bicentennial this year. 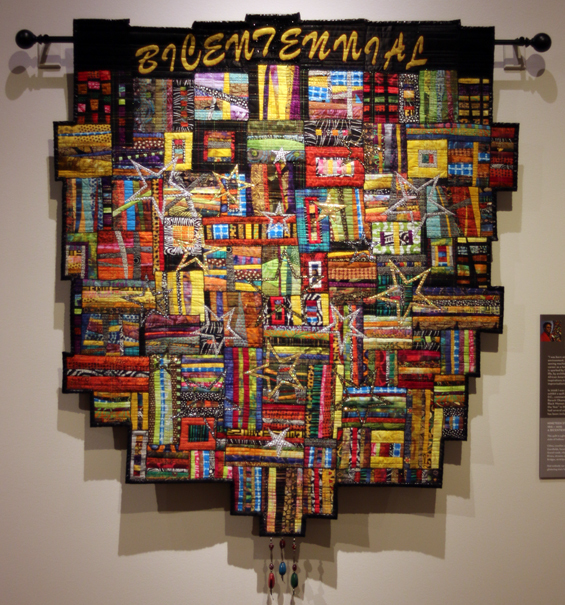 Entitled 200: Threads of time, the challenge pieces all had a bicentennial or 200 theme and received the Indiana Bicentennial’s official endorsement. 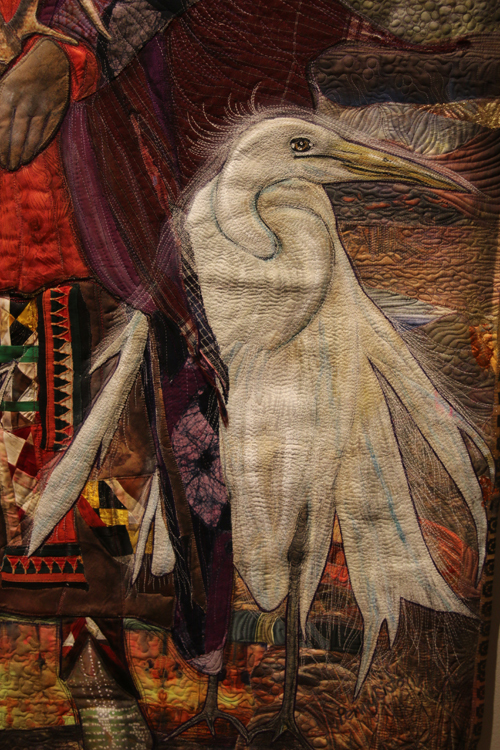 The following are a few from the 200: Threads of Time Indiana Bicentennial portion of the exhibit. 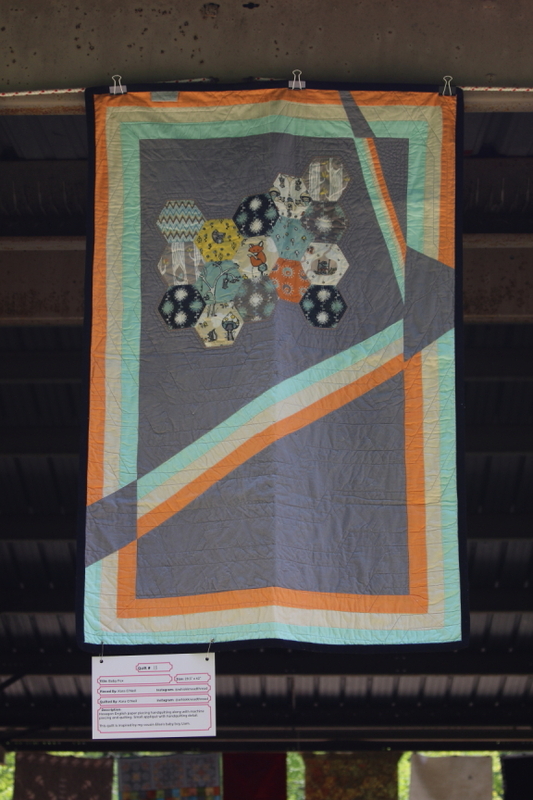 We had a small grouping of Indianapolis themed quilts. 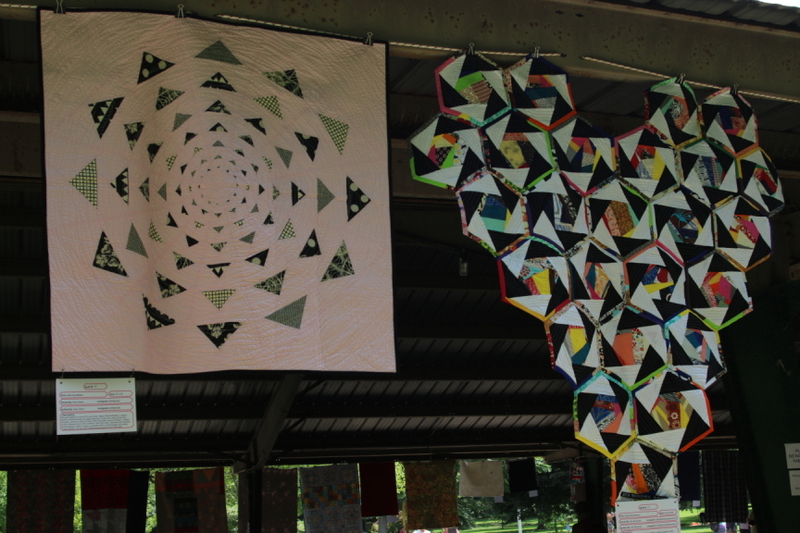 Here are my pieces (other than Bicentennial Orchid which is pictured above with the Bicentennial themed quilts) that are in the exhibit. 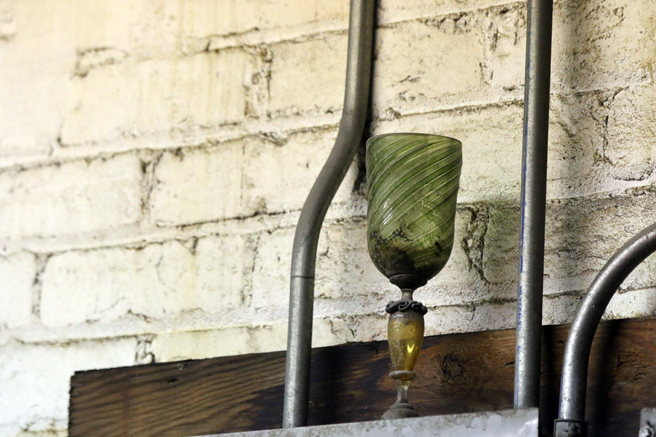 While I enjoyed the tour and seeing how different types of glass are made, I also enjoyed photographing things that caught my eye throughout the facility. 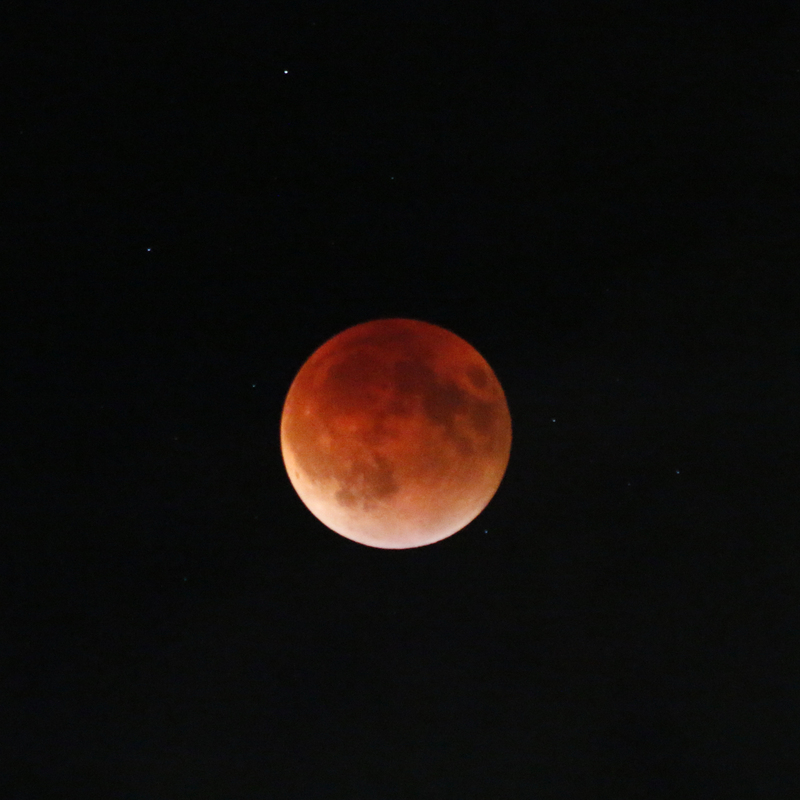 I’m an avid amateur photographer and take photographs every week. Often daily. This cute little face was so dirty, but still fun. 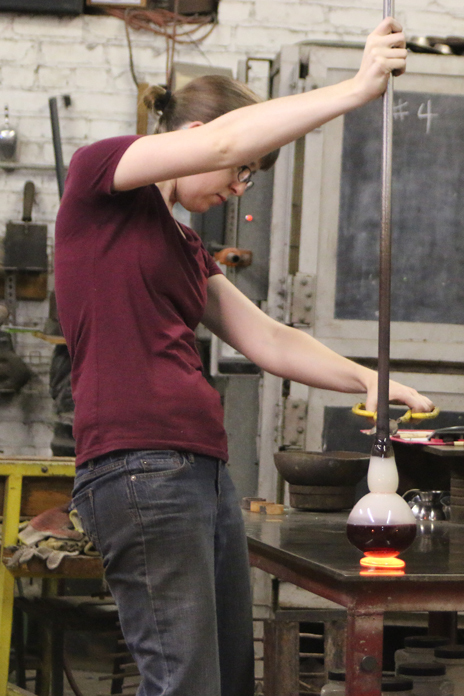 I had to laugh when one of my friends said she noticed that everyone else was watching the glass blower and my camera was pointed away from her at the wall. 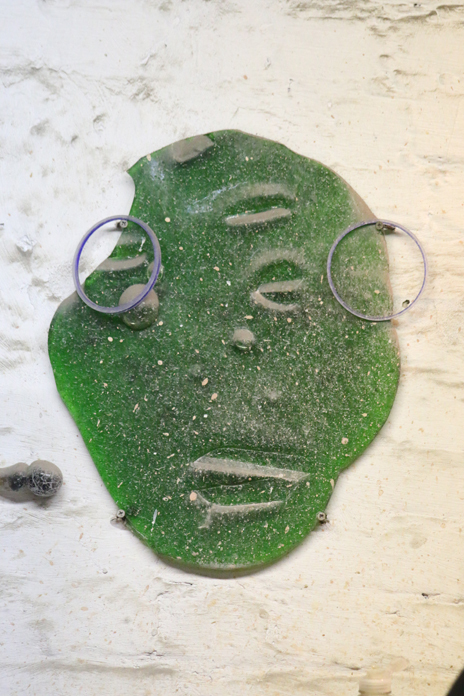 There were cute little items made of glass here and there on the walls and most had been there for years and were dusty. They made me smile. 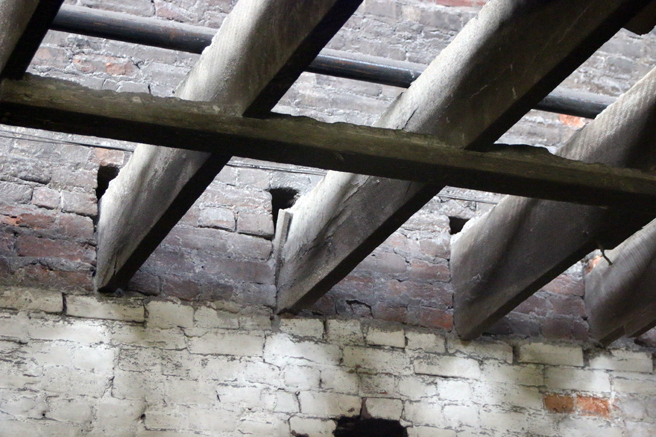 an open window in the oldest part of the factory which made scissors. 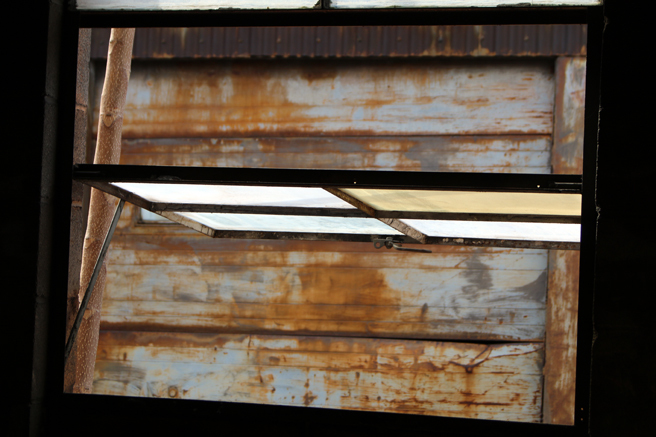 I loved the age of the building and the rusty view. 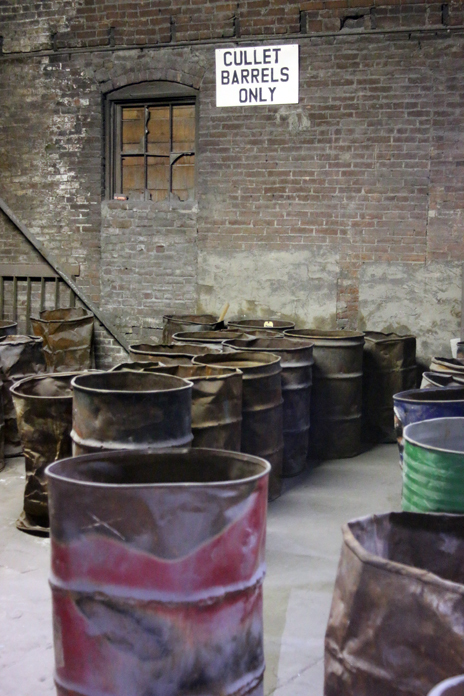 cullet barrels that hold the scraps that are saved and can be remelted and reused. 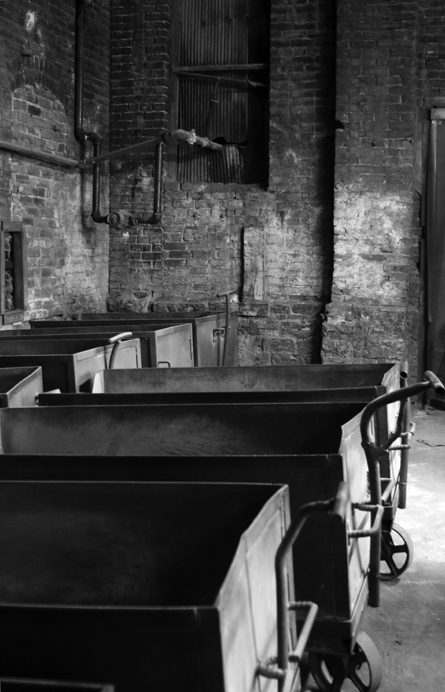 These are some barrels who have gotten many decades of use. 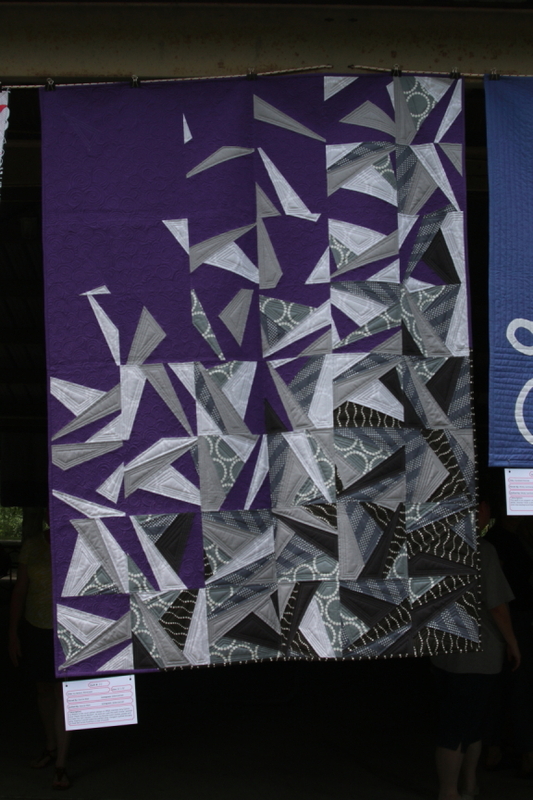 I wondered at times which looked better: black and white or color (of which they didn’t have much anyway). 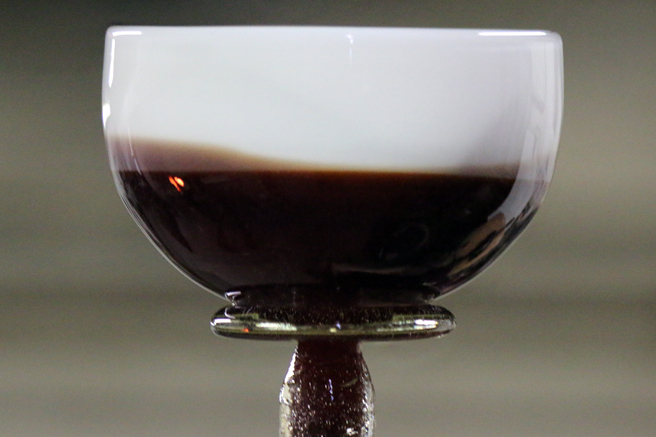 Color pic of carts to move around glass recipe ingredients. 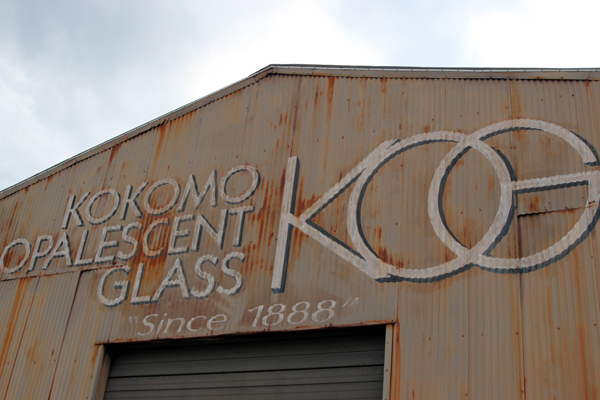 I hope if you are ever in the Kokomo area (central Indiana), you will make have time to get there and take the tour. 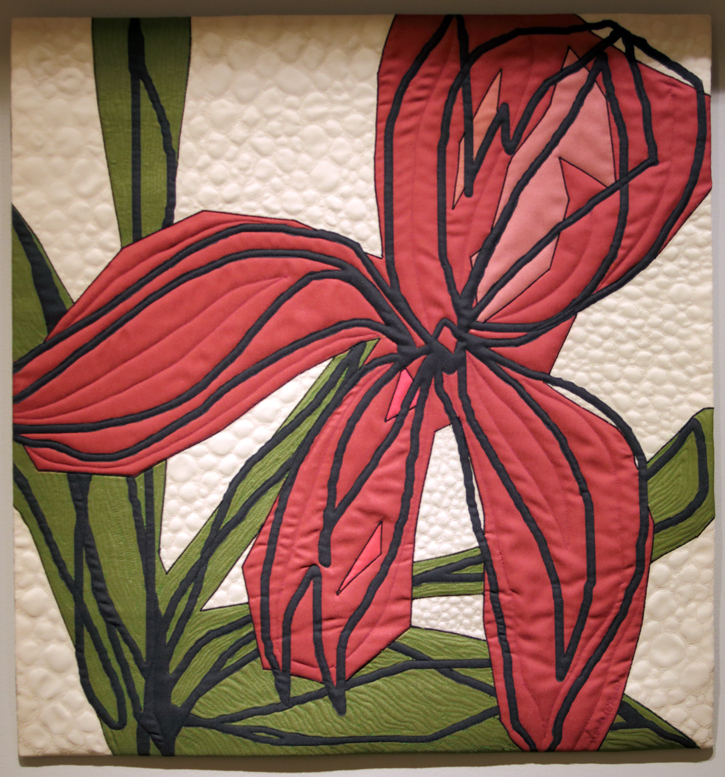 I enjoyed a tour of Kokomo Opalescent Glass (KOG) with a small part of my quilting bee. 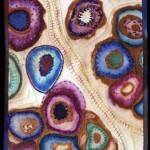 My mom made leaded art glass when I was growing up. So I always liked seeing the glass she brought home from KOG. 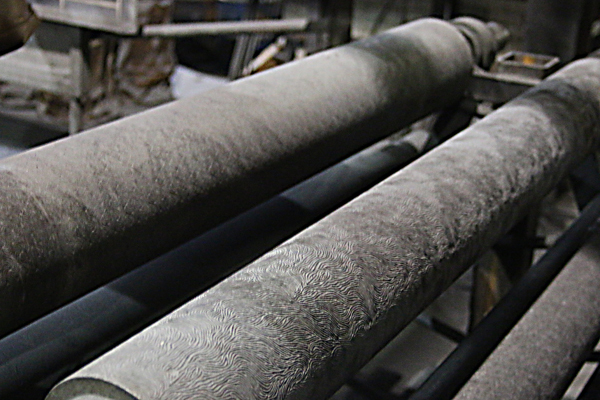 The ends were thick and lumpy from the rolling process and the colors swirled together. 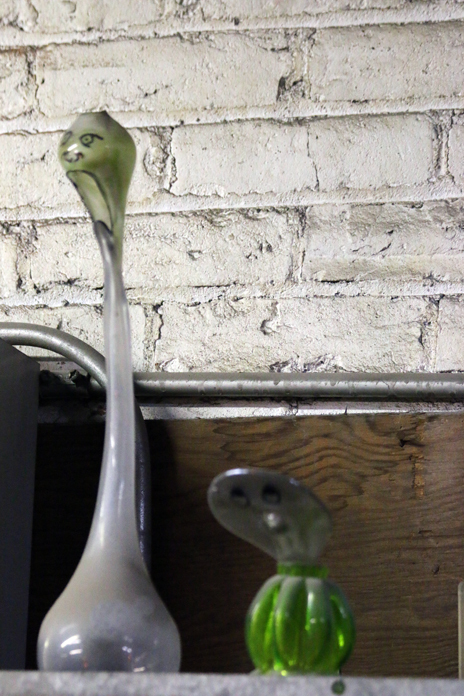 When I she and I made a stained glass for a lifelong friend, we went to KOG to buys some glass. 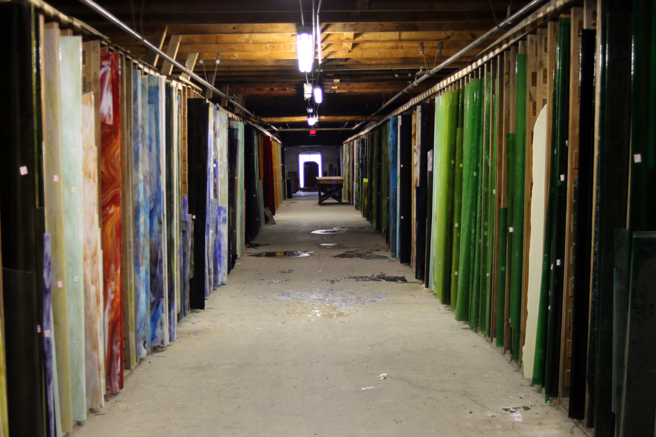 It was a joy looking through all of the beautiful sheets of glass. So when my friends asked if I wanted to go on the tour, I didn’t hesitate to agree. The tour didn’t disappoint! We had an enjoyable time and learned a lot. 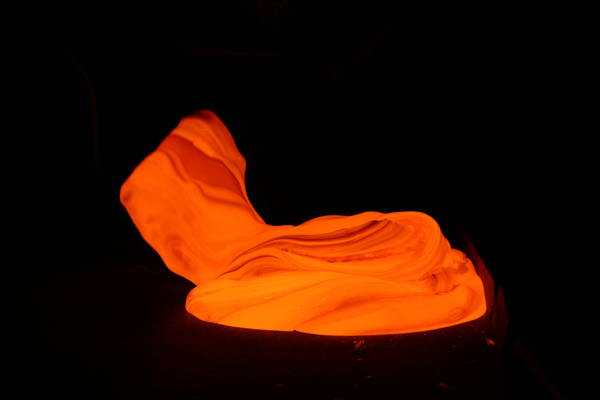 I loved photographing the glowing fires and glass. 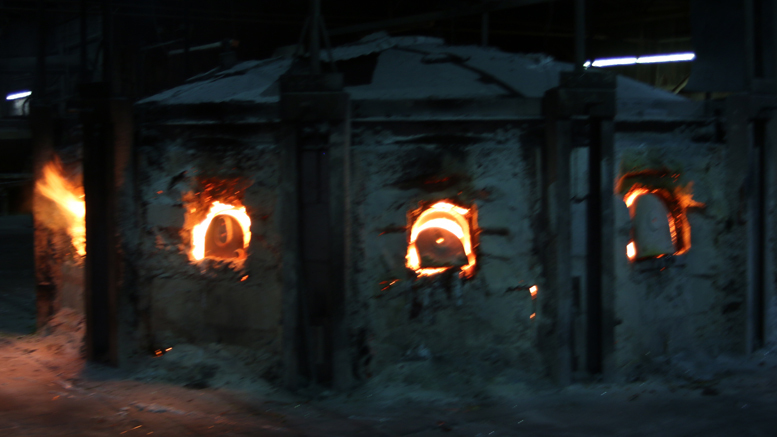 The glass furnaces that run 24/7. 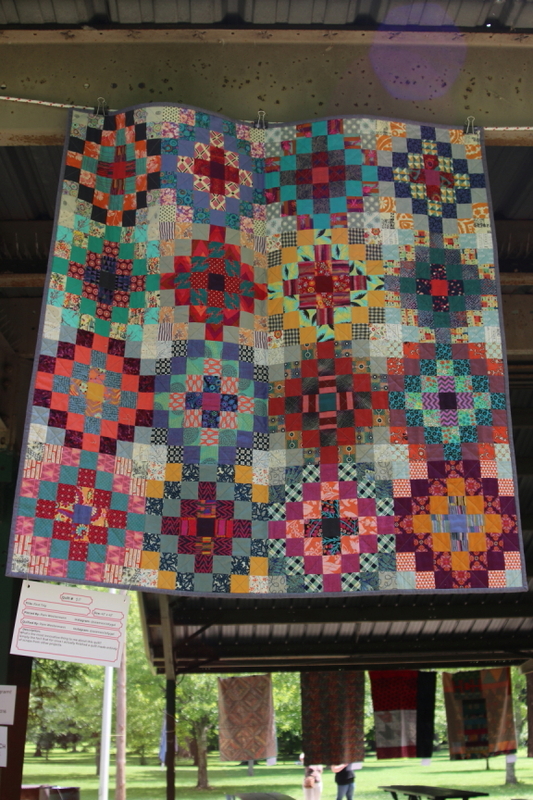 These are very large, but no one is standing near it to get the scale. A furnace that hasn’t been installed yet. 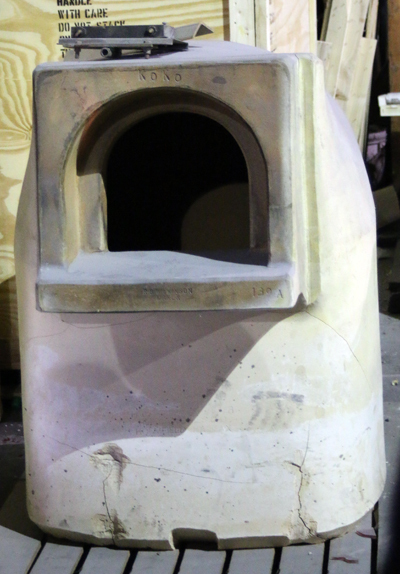 oven that the furnace goes into to heat up to be able to install it into the big octagon of furnaces. 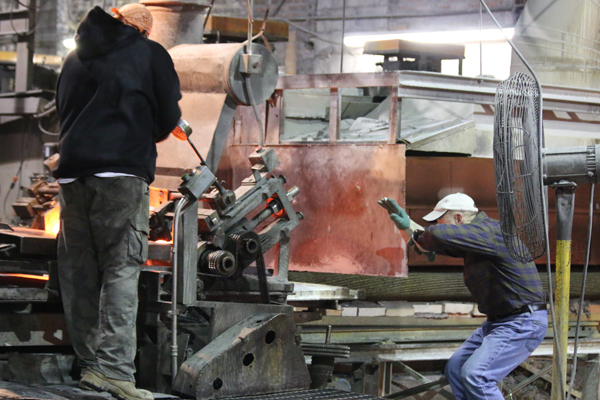 Which has to be installed hot while the other furnaces are burning. And fast so it doesn’t crack from the temperature difference. 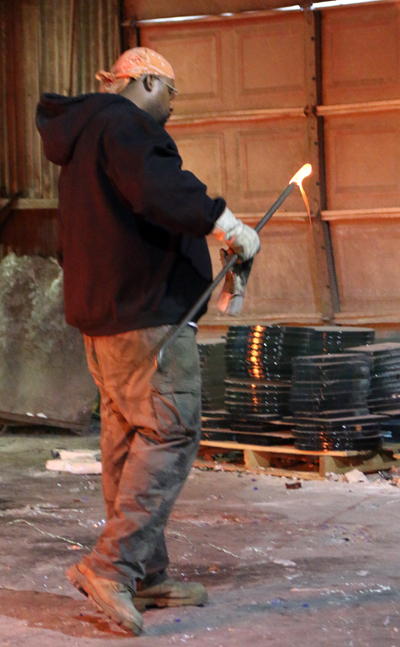 testing if the molten glass is ready to go. 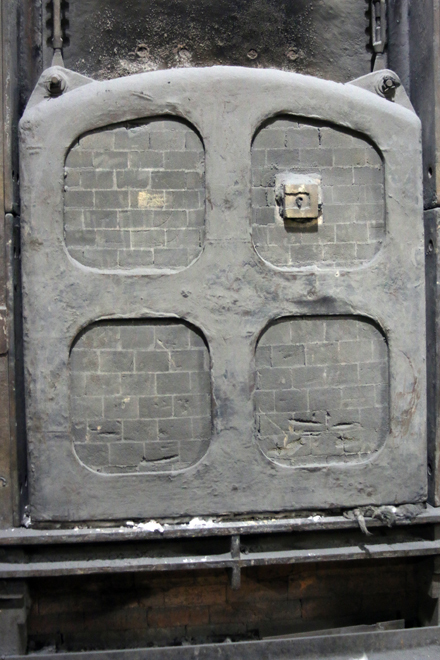 Glowing door to a furnace. 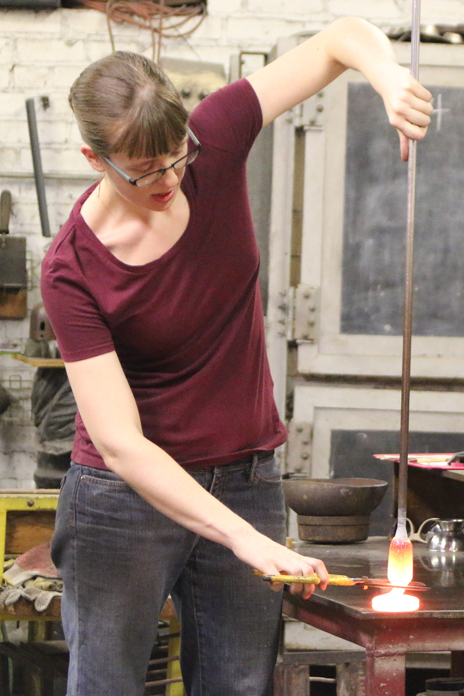 Hot glass in a very heavy metal ladle. It has to be moved quickly to keep it from cooling off too fast. 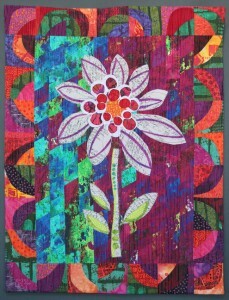 Stirring the colors together for ribbons of mixing colors. 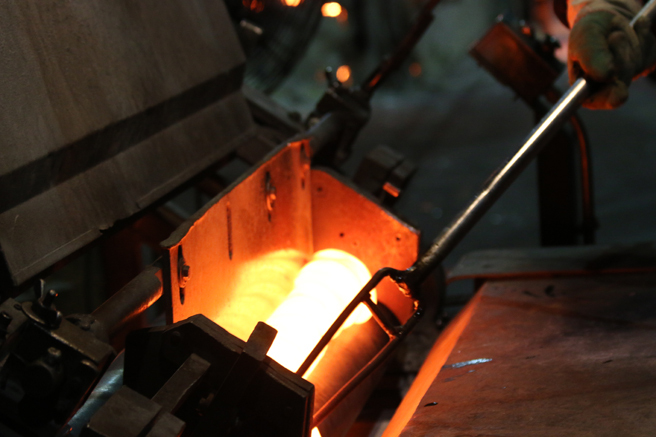 Pushing the stirred molten glass into the rollers. 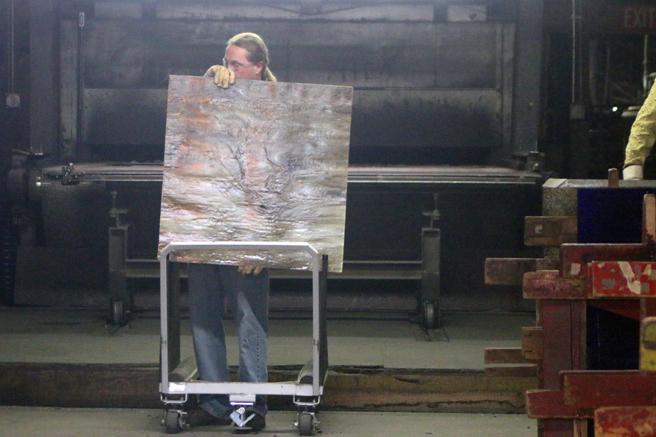 Directing the glass going into the rollers and coming out as a textured sheet of molten glass and then off to the ovens to cool down slow enough to not crack. The head of a glass sheet that is cut off because it is not even. 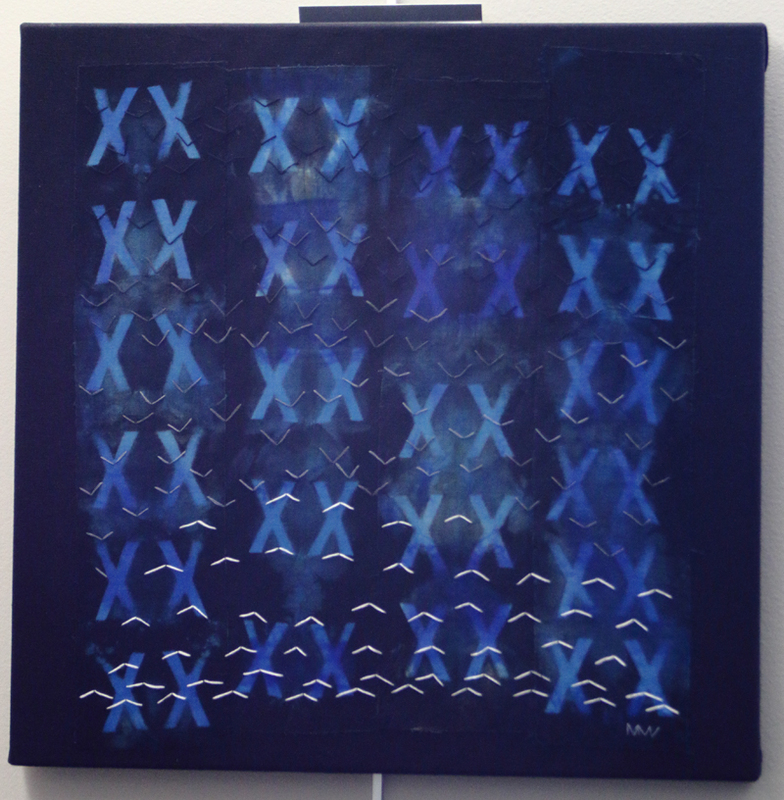 I enjoy these pieces in their irregularity. 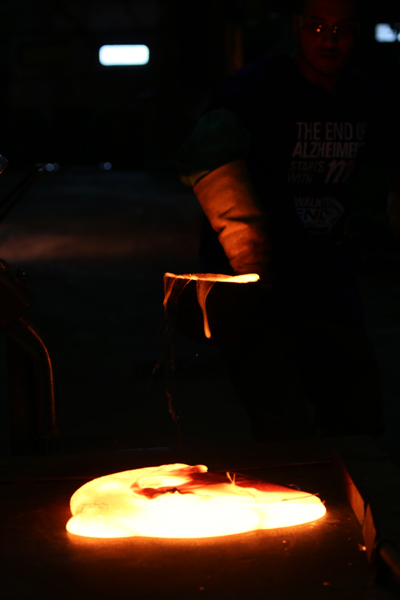 I had a lot of fun photographing the process, in particular the molten glass and furnace. 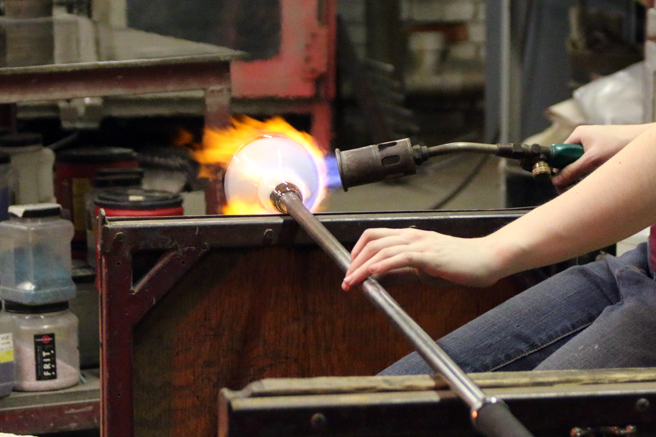 Glass blowing is something that has always fascinated me. 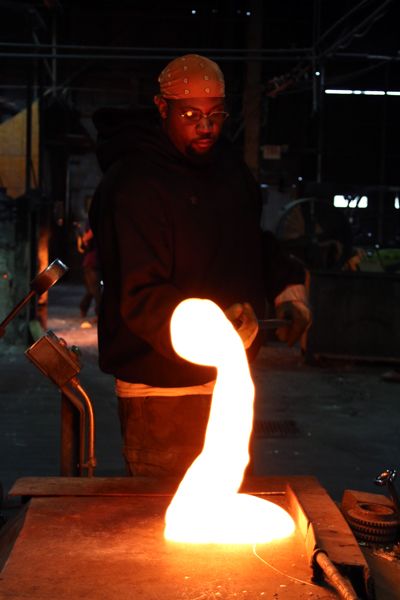 Working and shaping hot molten glass . . . what’s not to love? 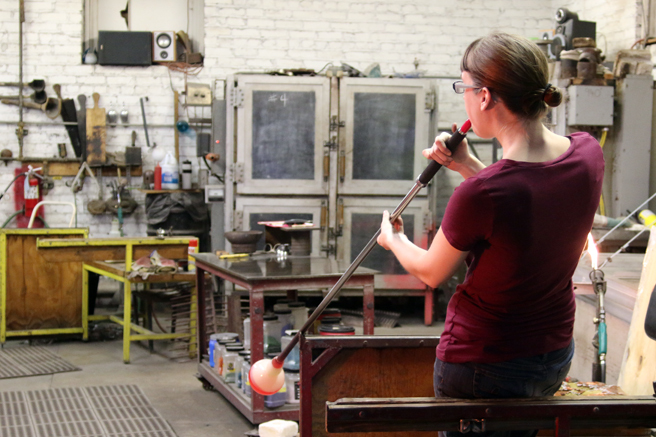 I enjoyed living in Tacoma, Washington where there is a very large glassblowing community. 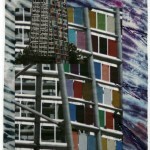 My parents lived in the same apartment building as Dale Chihuly and his assistant. Now there is a wonderful museum of glass in Tacoma. 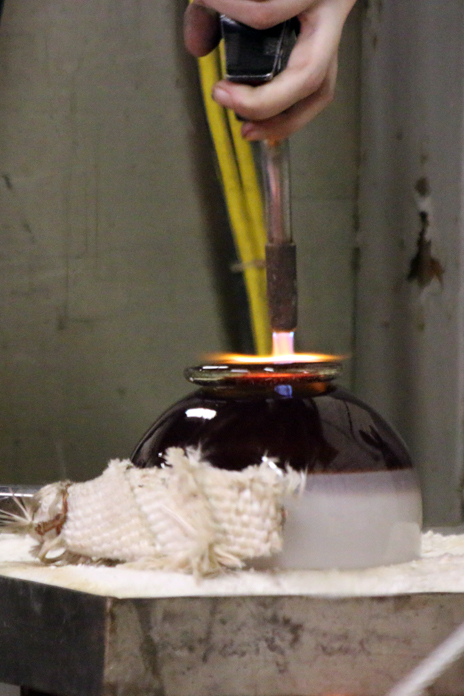 A glassblower at KOG was working on a bowl like the ones seen behind the IU awards on this table. Projects for clients. 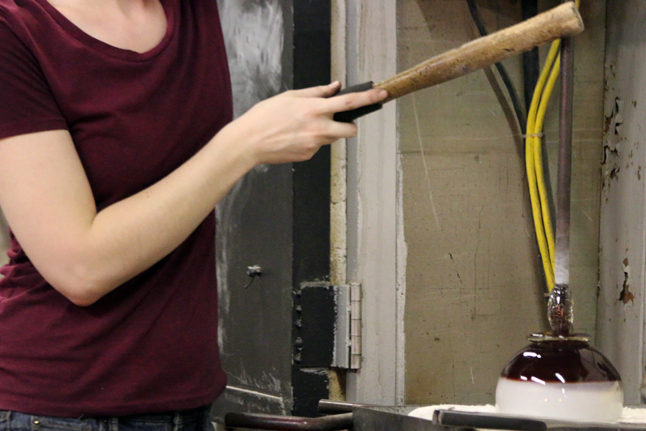 The red one’s are awards for Indiana University and the bowls are what we saw being worked on in the blowing studio. 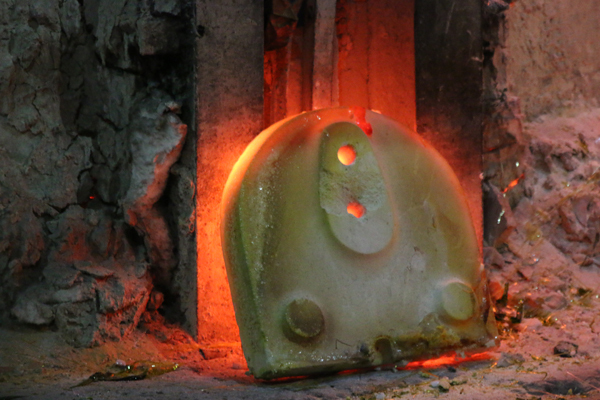 Blowing and shaping the bowl. 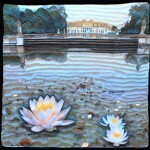 I had been to Kokomo Opalescent Glass (KOG) before when buying glass for a lifelong friend’s stained glass she asked me to make for her historic home remodel. 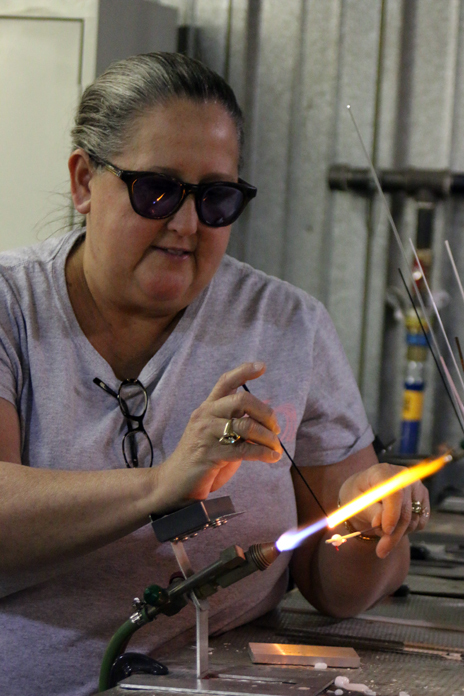 I really enjoyed looking through all of the beautiful glass they make and had a tough time just picking out what was needed for the project. 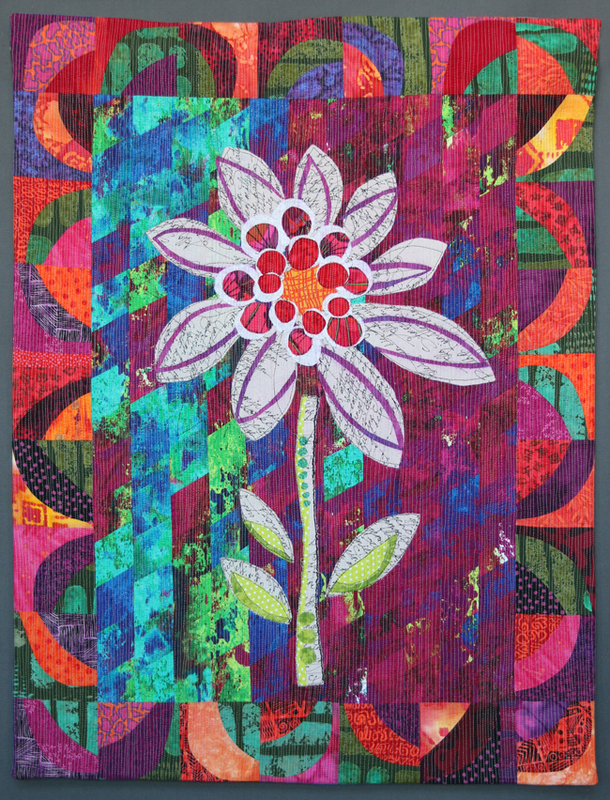 All of the quilters out there know what it is like to go into a quilt shop and see the gorgeous “eye candy.” This is the same feeling: heart leaping with all of the possibilities for the beautiful supplies! So, KOG is 127 years old! That in itself is amazing. They opened in Kokomo because they were given free gas and there was a good supply of it. They got that deal for many years until the gas supply dwindled. They have had gas bills as over $65,000 in a month! Yikes. 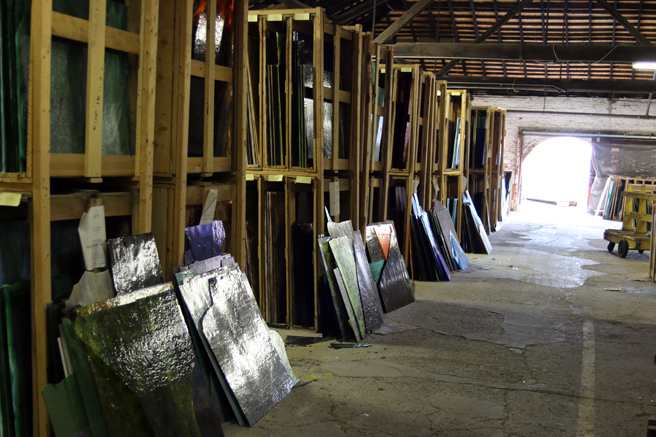 Needles to say, there is also not a high margin on glass productions given those expenses. They give tours once a day on weekdays. We expected the tour to be a few people and it ended up being over 40. They split us into smaller groups and called in back up tour guides. We lucked into getting the CEO. He requested going last and I’m pretty sure we got a longer tour with a little more detail to our tour. 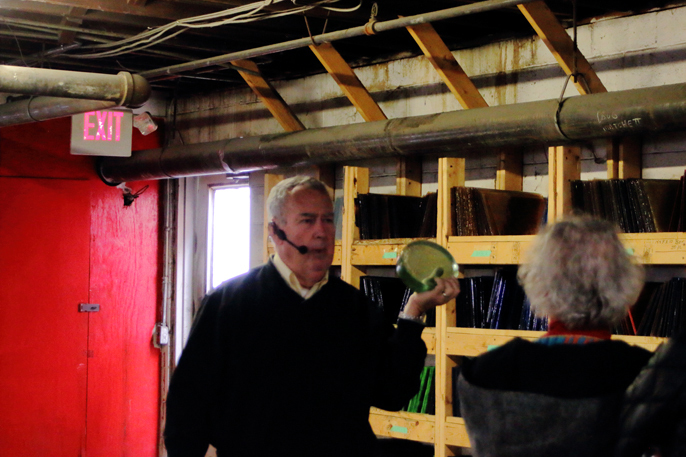 John O’Donnell was a very knowledgeable and interesting tour guide. 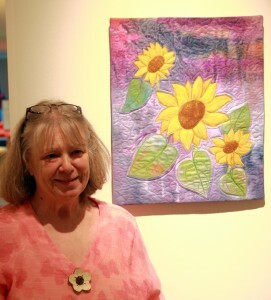 His wife, Patty, joined us and was very knowledgeable as well. 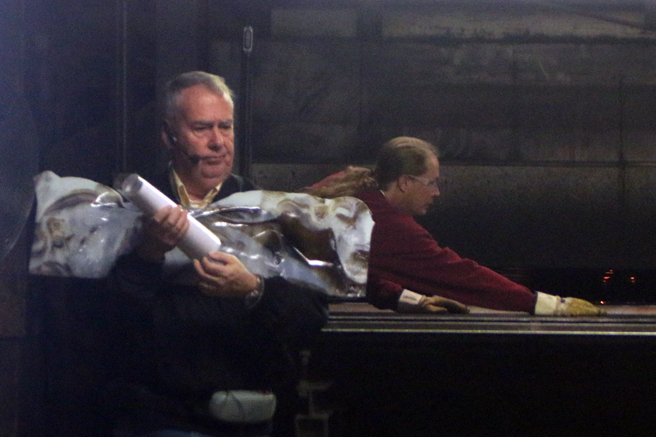 John holding glass for the Washington DC metro in a warehouse. 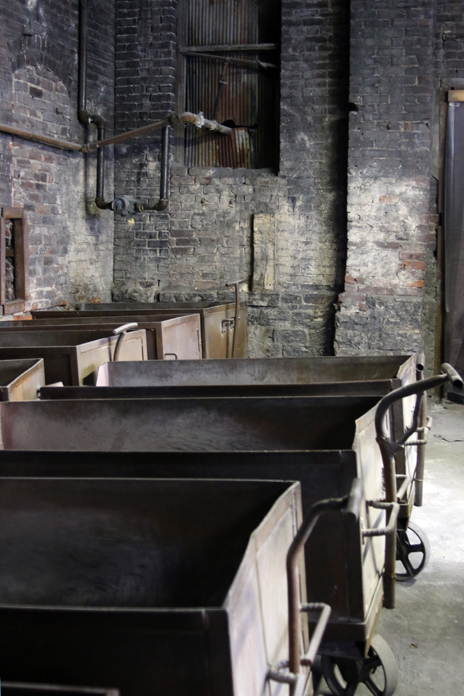 There are multiple buildings in the complex, but the original building was a scissors factory prior to glass, so it is older than 127 years old. 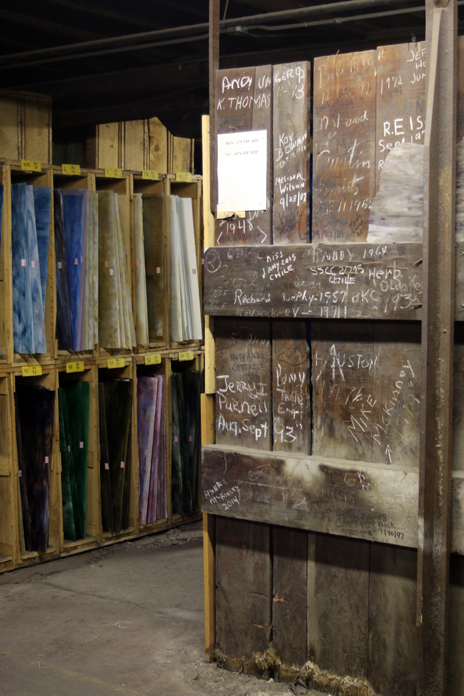 There were rows and rows of sheet glass stored. 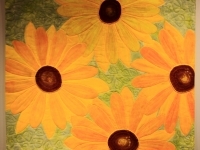 I was surprised to hear about the scope of their business and customers. 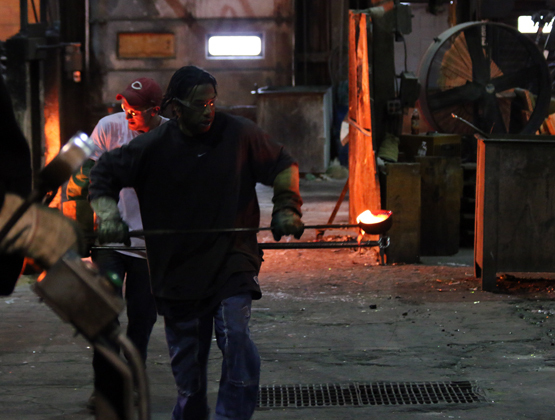 They are one of about 6 glass manufacturers of the type in the country. 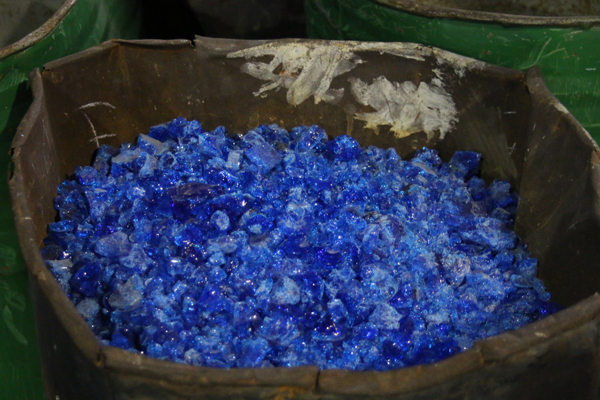 They supplied a lot of glass to Tiffany’s over the years and still have the recipes used originally and still get repair work for Tiffany glass. 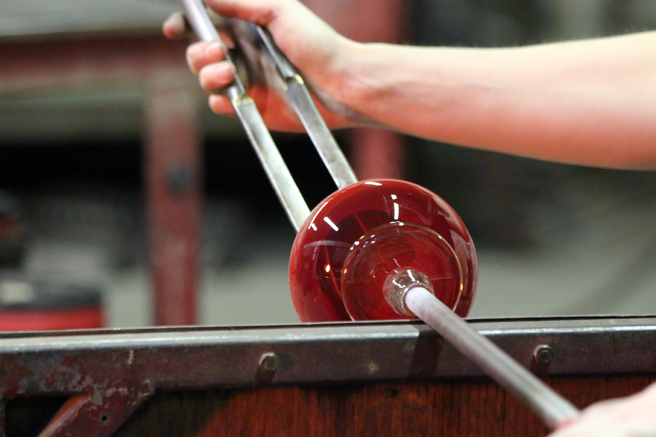 Glassmaking has not changed a lot with the times. 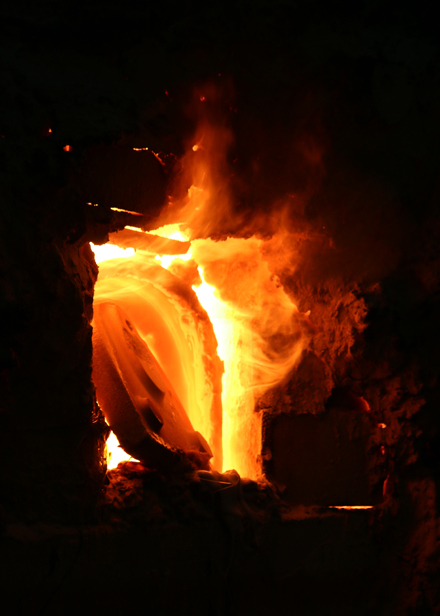 You are still melting sand and additives to molten states in ovens and manipulating it how you want it. Projects for clients. 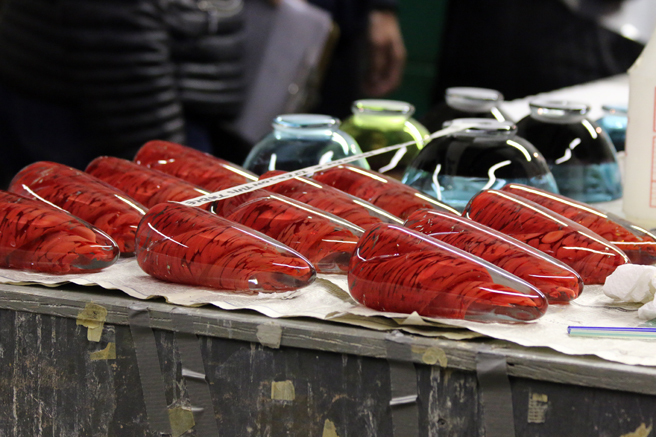 The red ones are awards for Indiana University and the bowls are what we saw being worked on in the blowing studio. 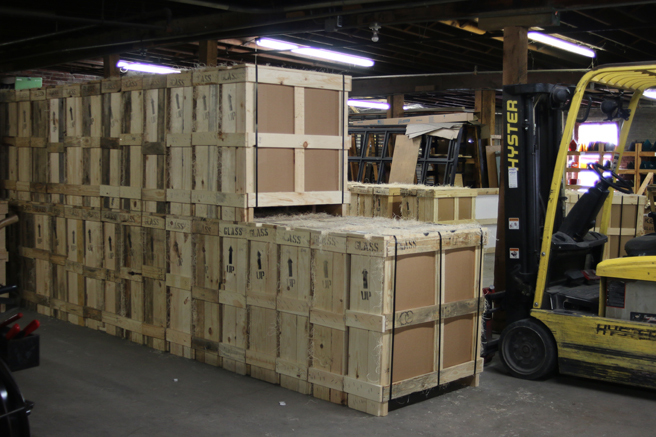 They had a container shipment ready to be loaded in a container bound for Japan. 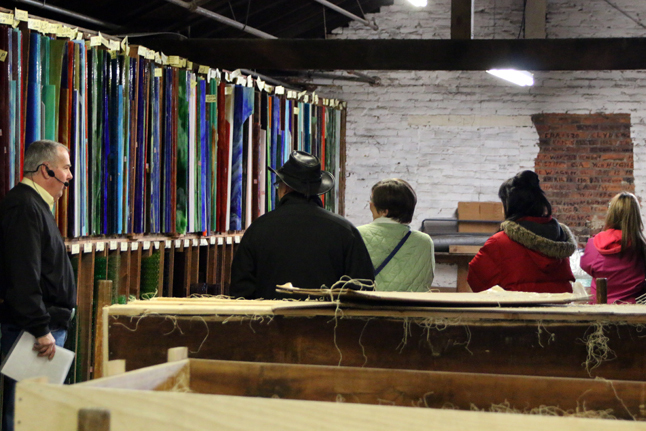 Here is part of our group looking through a warehouse while John talks about the original unpainted brick wall that employees signed and dated over the years. 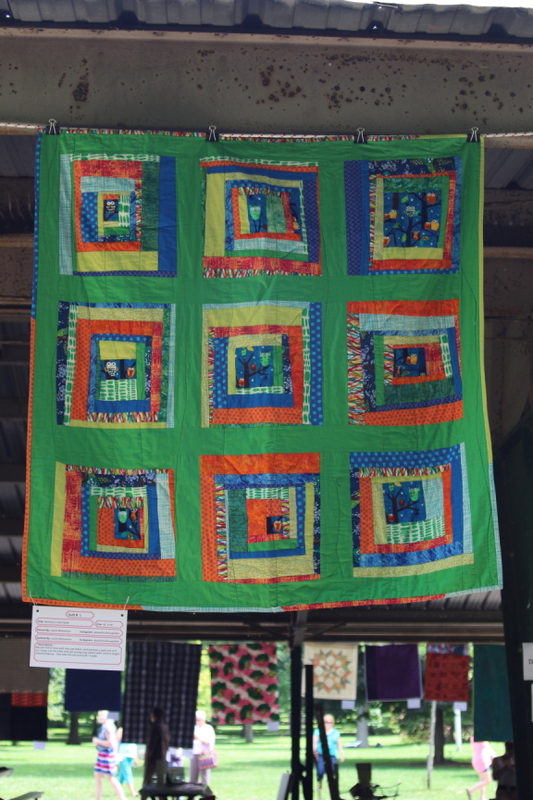 A quilter friend is in the light green jacket and the woman in red is a visiting Pakistani missionary who was there with her husband who had on a velvet suit. 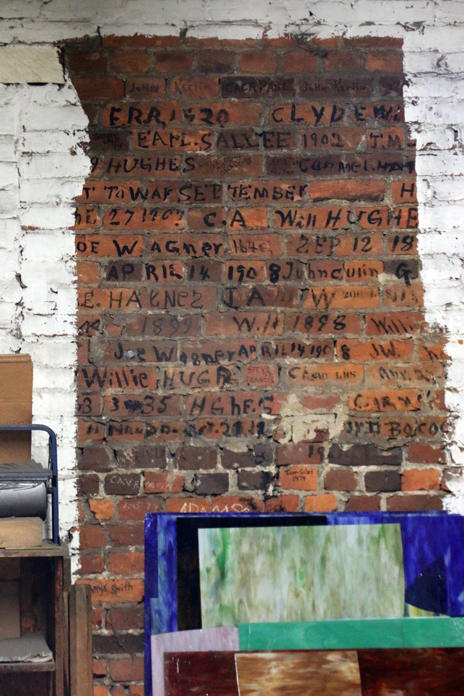 While this brick wall is more enduring, there still remains wooden shelving that has very old signatures as well! 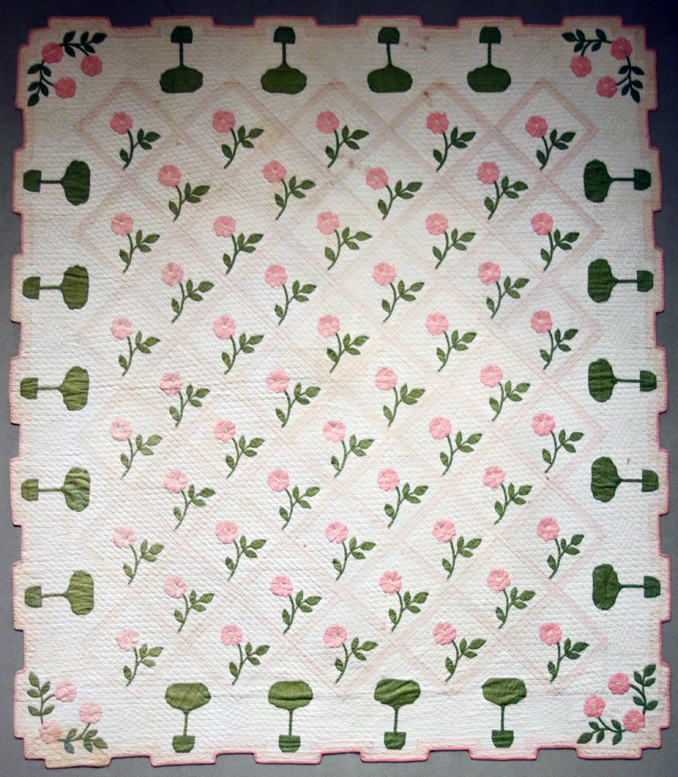 It looks like they place broken sheets at the ends of the rows. The man who was doing the cut class/stained/leaded glass had just finished a piece (a wolf that was lovely and I should have taken a pic of him holding it up). We didn’t get to see him working and thus didn’t take any photos. 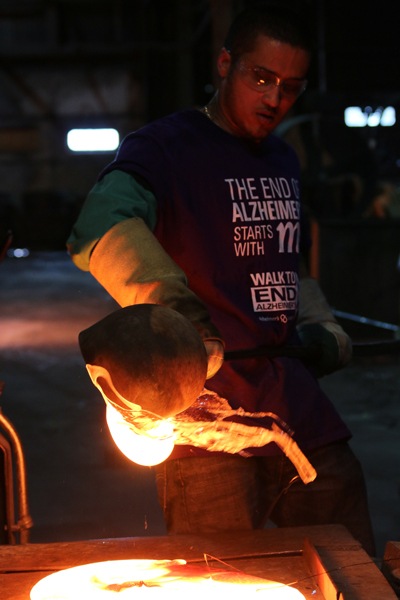 We chatted a bit after the tour and he showed me a picture of the leaded glass he made for Elton John. I took so many pictures (350+), that it is going to take a few posts to share them all. 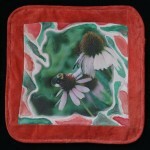 I will post on glass blowing, sheet glass making, and general photography yet. A few of us are planning to go back and take a class or two. 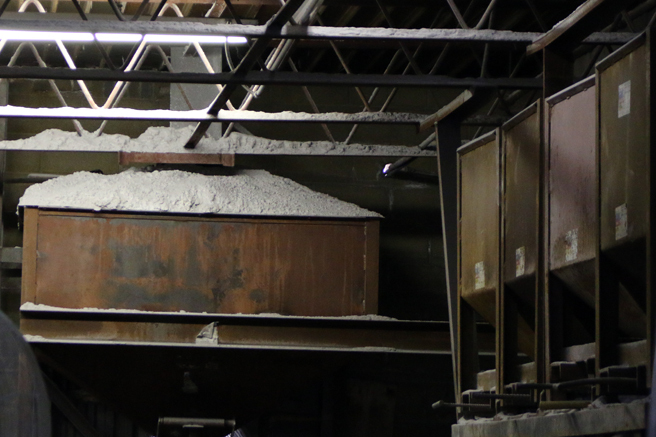 So if you find yourself in the Kokomo area, think about a tour. 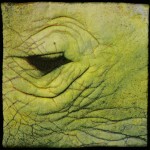 More posts to follow! 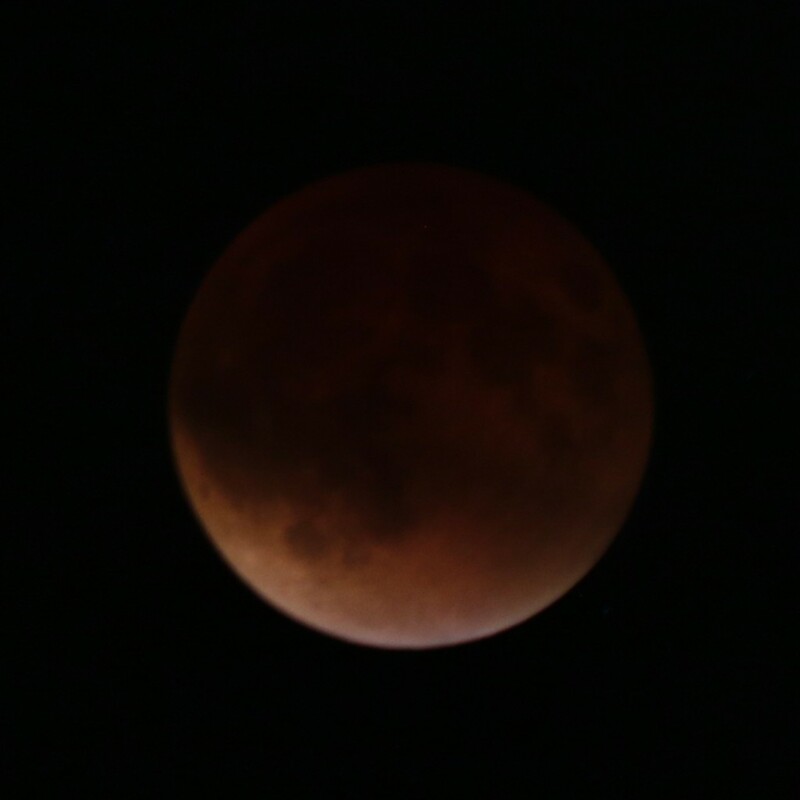 We have had such beautiful weather lately with lots of blue skies that I was a little surprised to find out we were very cloudy for the Supermoon Eclipse! 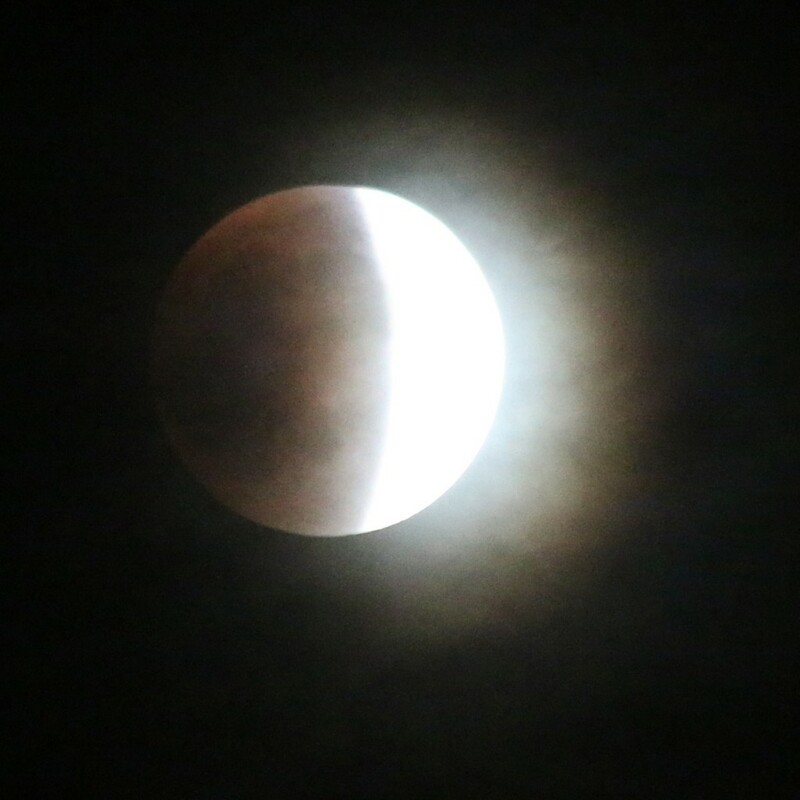 I was so disappointed that I was unable to see most of the eclipse. But there was a short period of the beginning we could see. 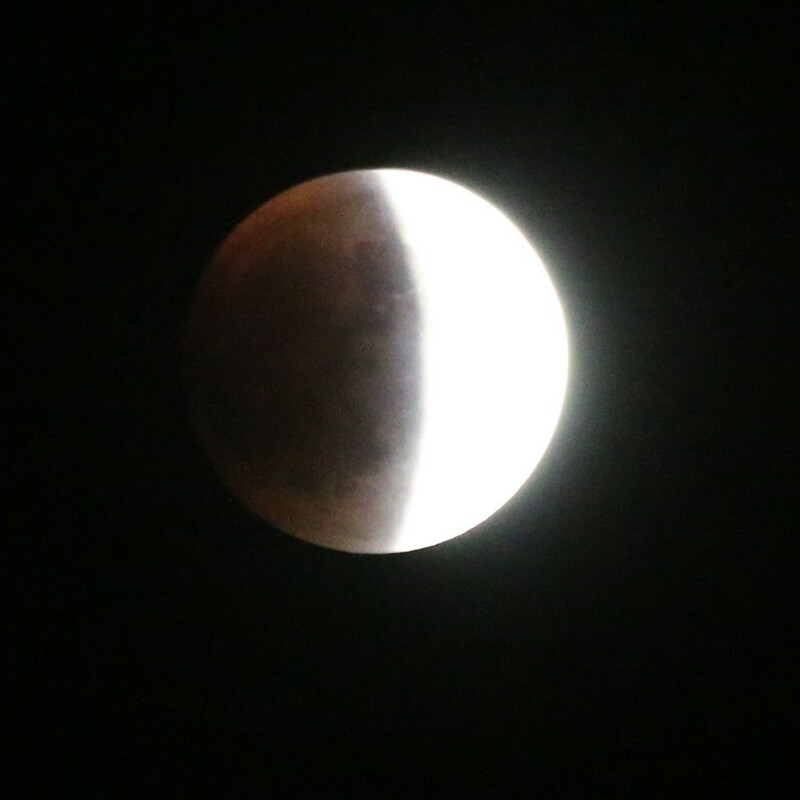 Then only a little of the full eclipse. I have a nice camera that I upgraded to last Christmas, so I was anxious to see how I could do with it. I tried lots of different settings and enjoyed seeing the variety of shots the camera got depending on the settings. From huge haloing, to red, to fairly detailed when there was hardly anything I could see with the naked eye. These three are the same photogaph. The first (above) is pretty true to what I could see. 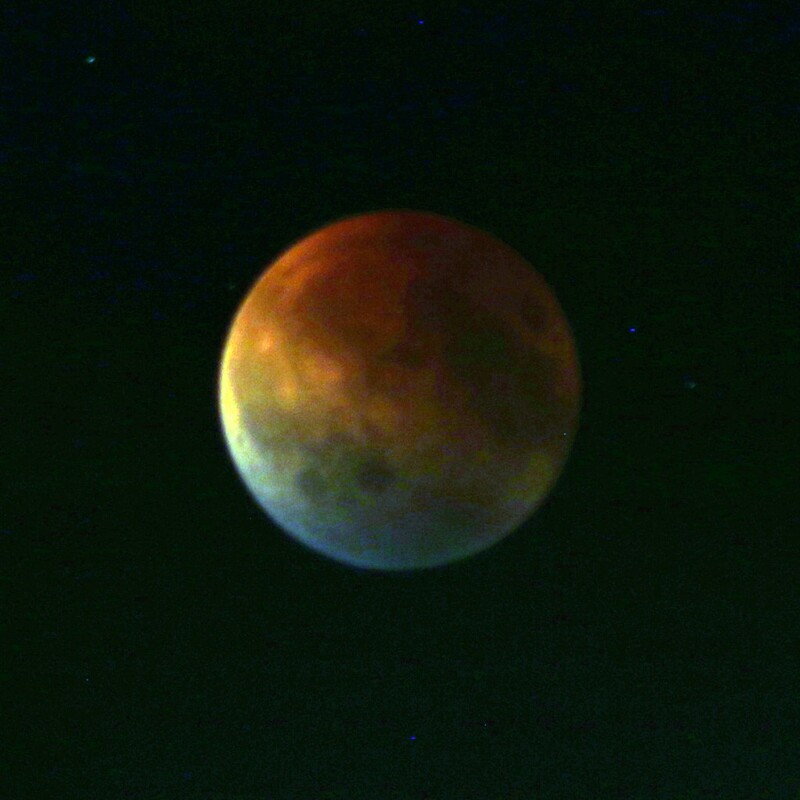 The second was adjusted for color. The third was adjusted levels. I thought it was interesting that it went to red white and blue. I have decided to call it USA Supermoon Eclipse. I think the next one is in 2018, so I’ll hope for better weather then. 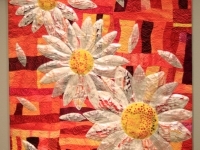 I visited the 19 Stars: Quilts of Indiana’s Past and Present exhibit at the Indiana State Museum and enjoyed seeing the beautiful quilts curated by Mary Jane Teeters-Eichacker where she chose 19 historic star quilts and 19 contemporary star quilts. Indiana was the 19th state to join The Union and next year is the state’s bicentennial. 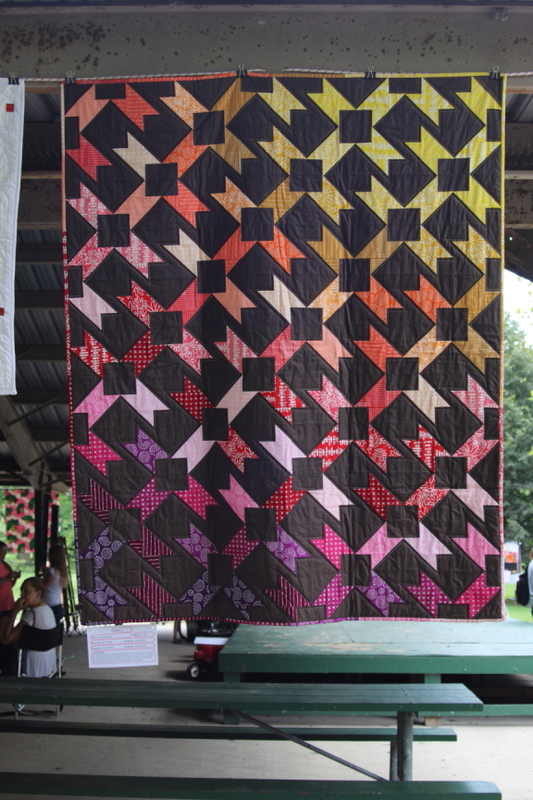 What a great way to get Hoosiers thinking of our upcoming 200th year, since quilts have been an integral part of Hoosiers’ lives. 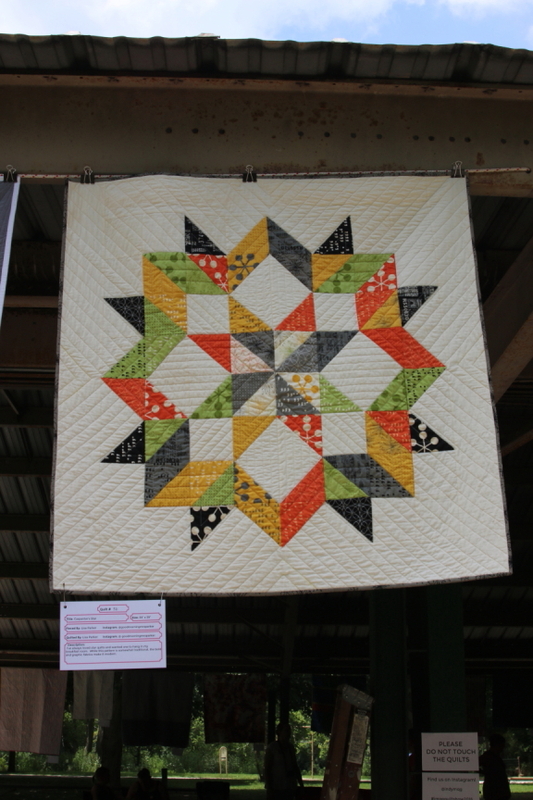 As a quilter I love looking at all styles of quilts. 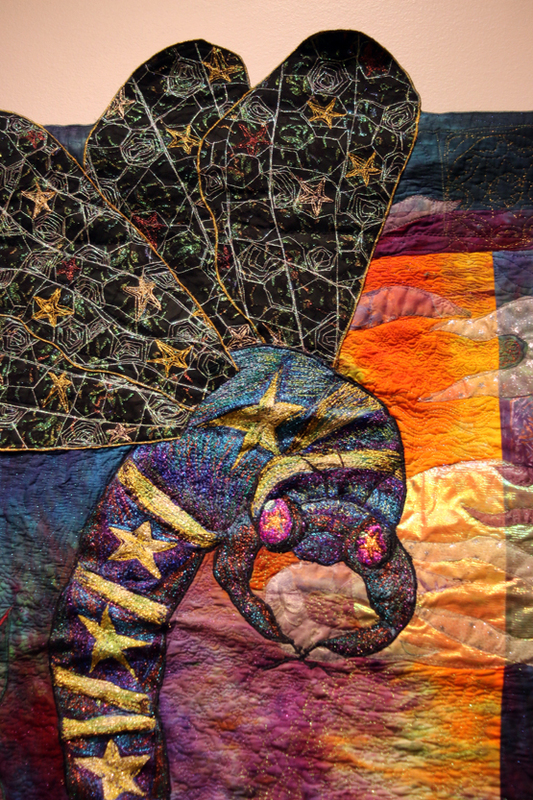 Although I am an art quilter, I can appreciate the love and labor that goes into making any quilt and enjoy a glimpse into another quilter’s brain through his/her design choices. 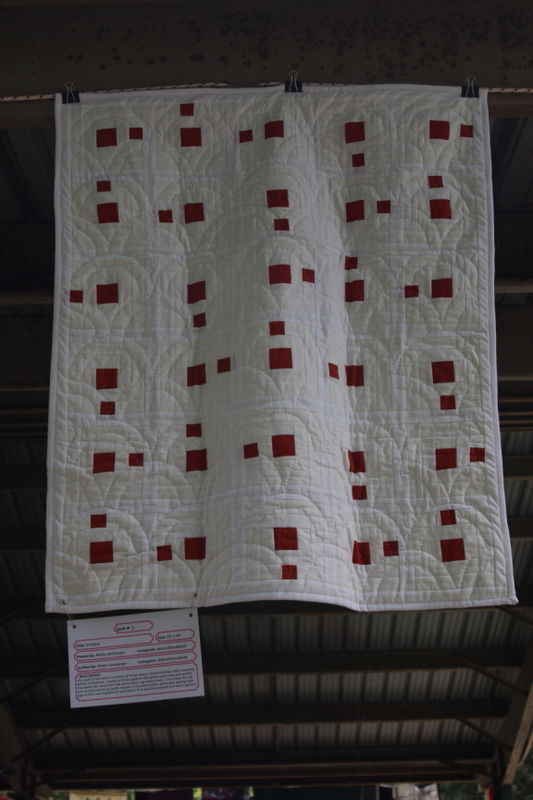 Given all of the quilting time in the world, I would try many, many styles of quilting. 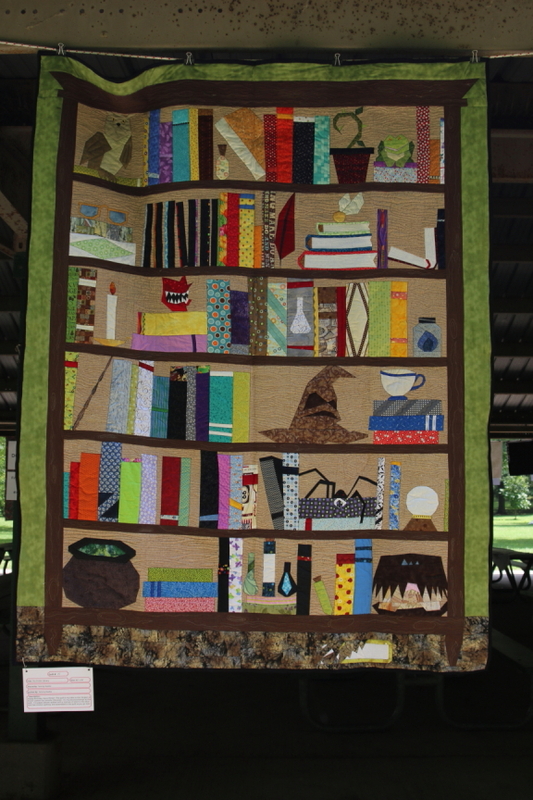 But, alas I don’t have that time and I have to prioritize my choices and art quilts generally win out. 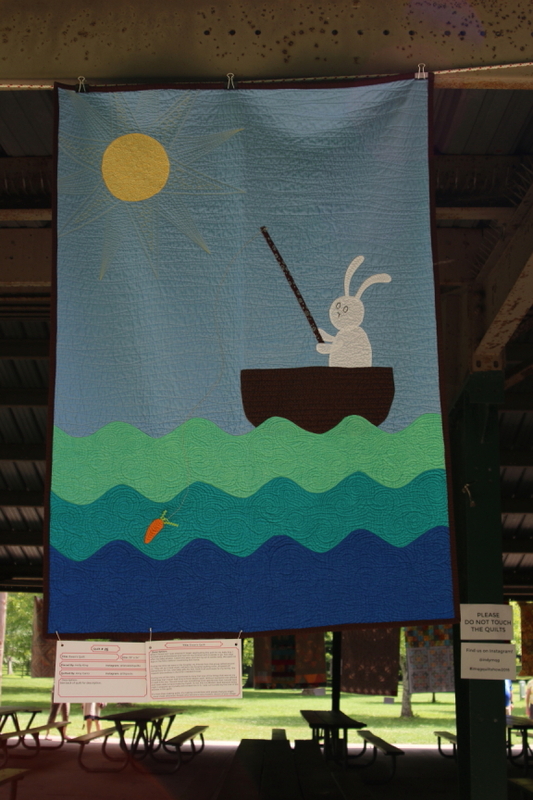 That being said, I enjoy seeing the contemporary quilts of the present than those of the past. 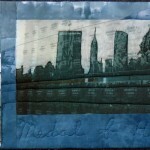 So I chose to hone in on the quilts from the present to share today, and art quilts by in particular. 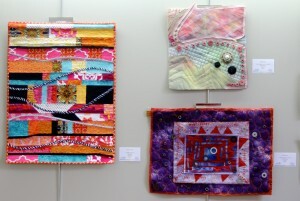 Here are three talented Hoosier artists’ quilts. 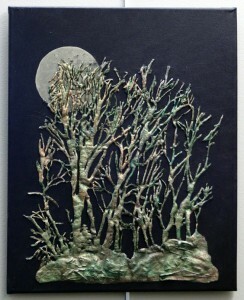 Frances Slocum’s Landscape. Oops. 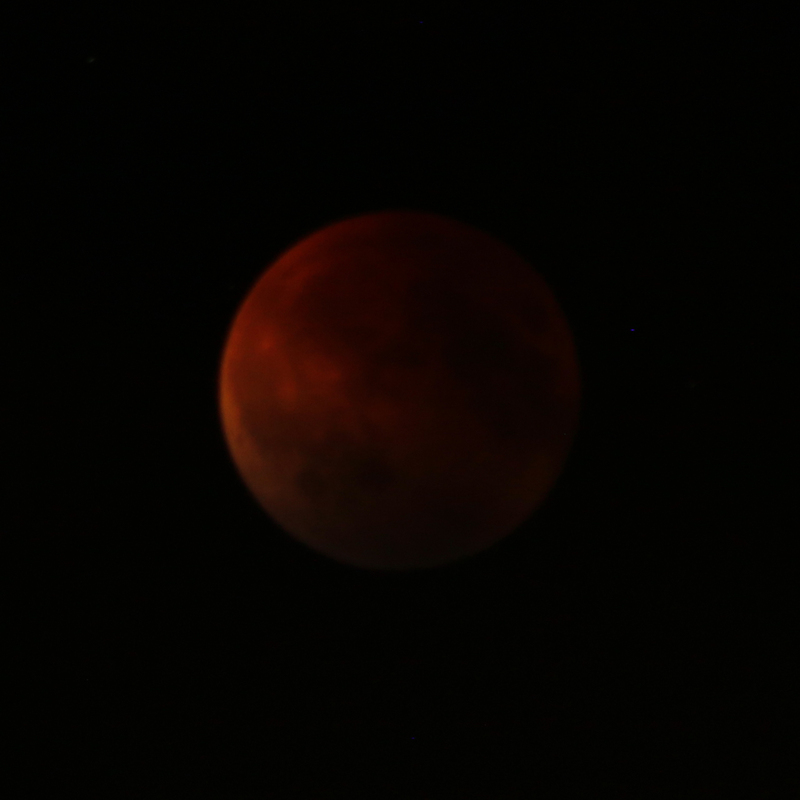 I forgot to get a whole shot! So here are two details. 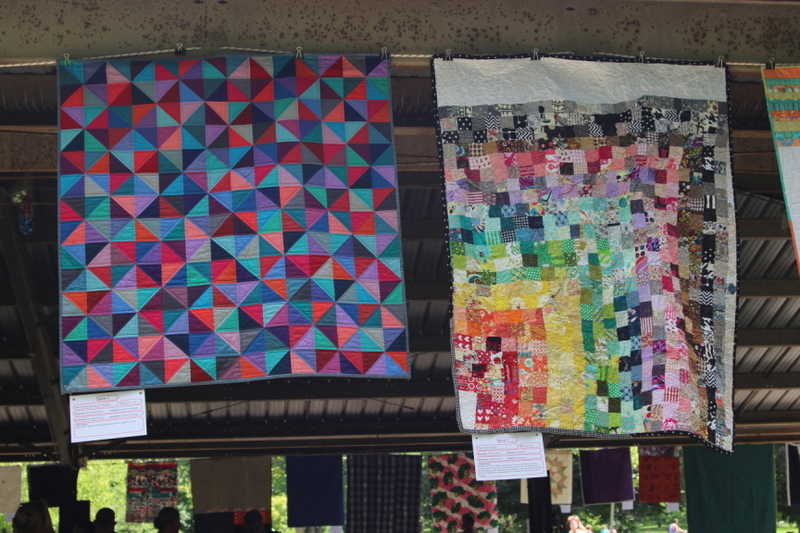 The types of quilts, though all are stars or have a star in them somewhere, are varied, beautiful, and interesting. 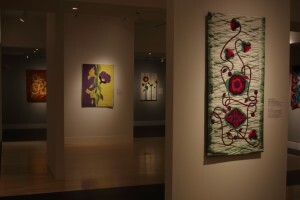 I hope you will go to the ISM and see the exhibit if you are in the Indy area. 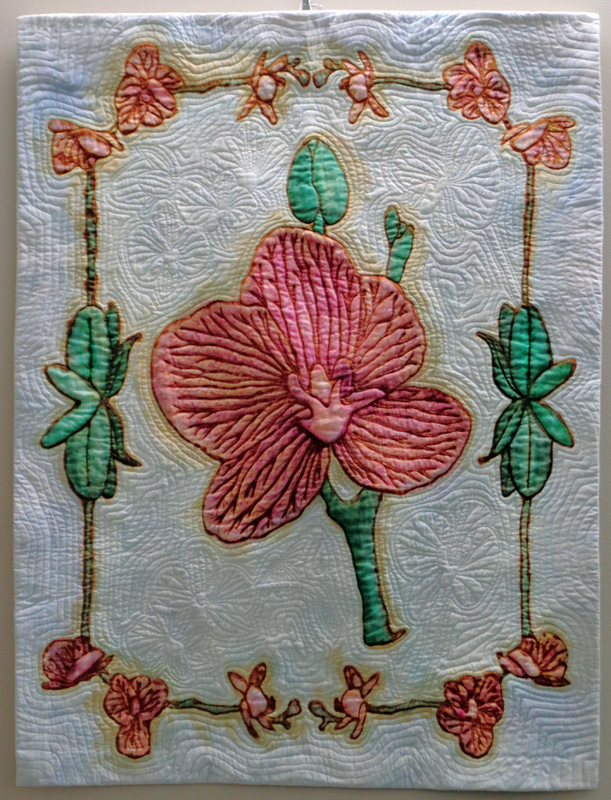 Yesterday I met up with the Studio Art Quilt Associates (SAQA) of Indiana at the Indianapolis Museum of Art (IMA) for the opening of a new textile exhibit of fashion with the Curator Niloo Paydar. 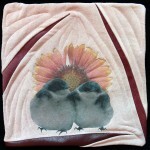 While I am not a big fashion fan, I do love fiber and textiles and getting together with others who love them as well. 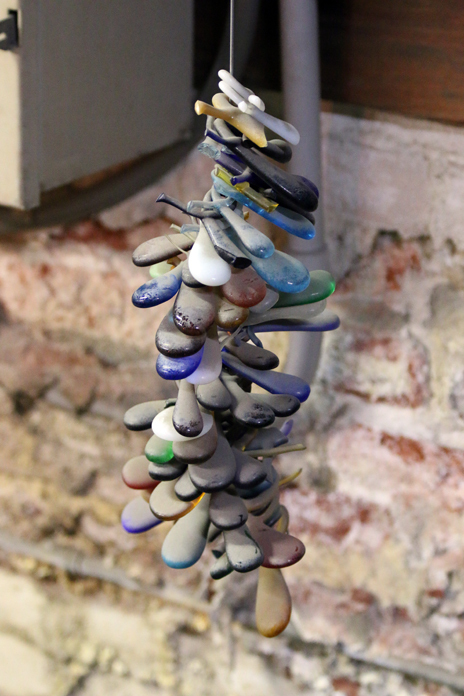 I really enjoyed the unusual, interesting, and beautiful collection that Niloo put together. It was basically chronological. The lighting was dramatic spotlighting the clothing while keeping the walls and the rest of the room fairly dark. So, while my pictures of people not in the spotlights didn’t turn out well, the clothing was well lit to photograph. 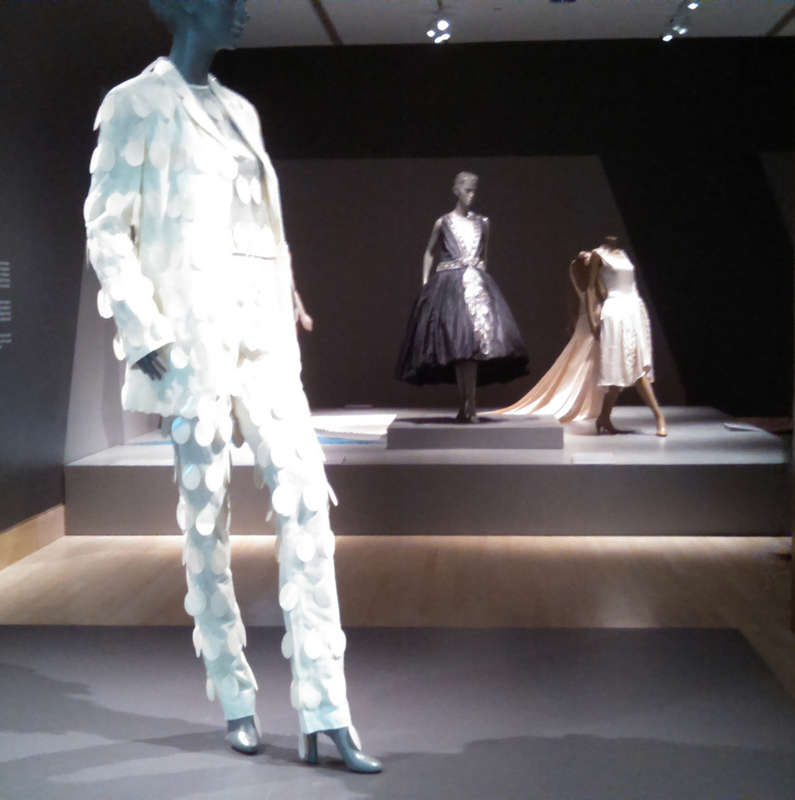 Entering the exhibit with a glow in the dark pantsuit by Stephen Sprouse. We met for lunch at the IMA cafe which is one of my favorite places to eat. Always fresh and delicious. 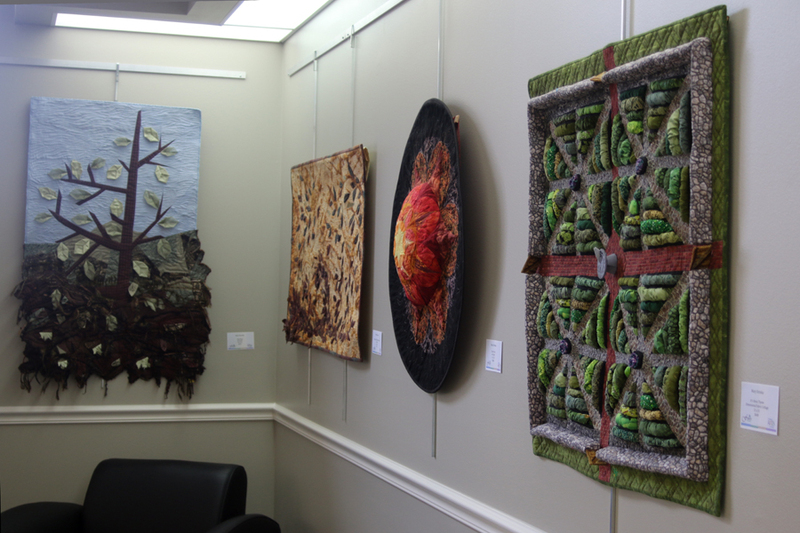 We discussed the upcoming SAQA exhibit that will be at the IMA next year. 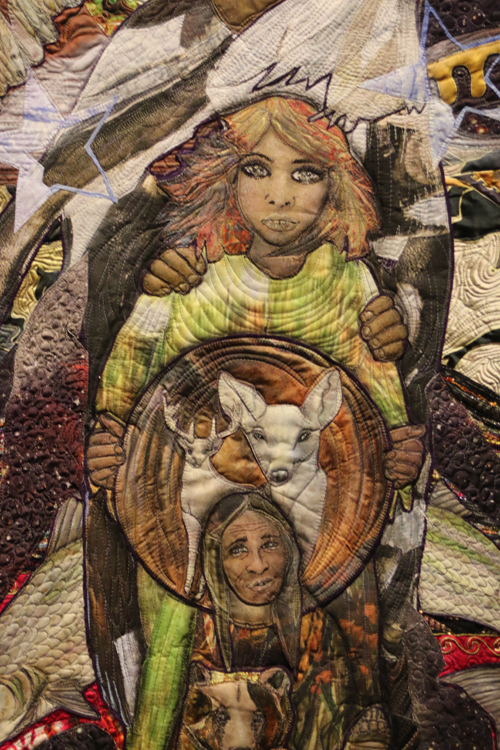 The call for entry is here and is open to SAQA members in these states: Indiana, Wisconsin, Illinois, Ohio, Michigan, Kentucky, Iowa, Minnesota, and Tennessee. 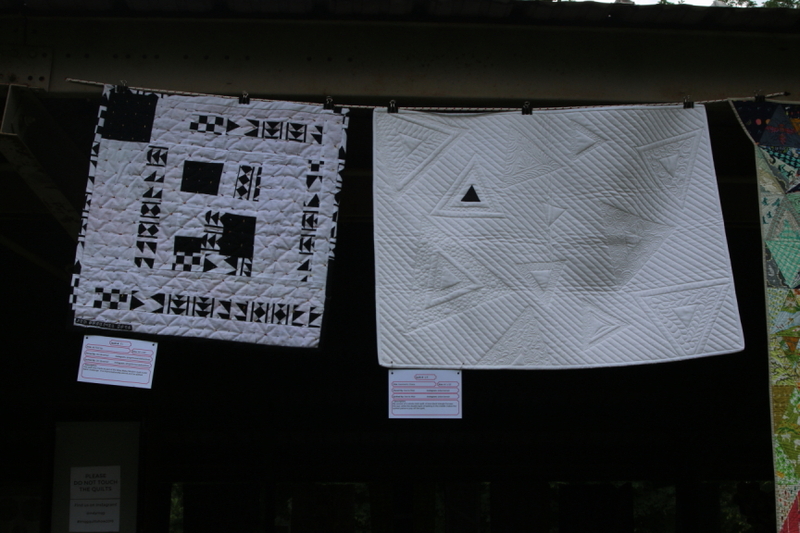 It is an artist response to Marie Webster’s quilts. 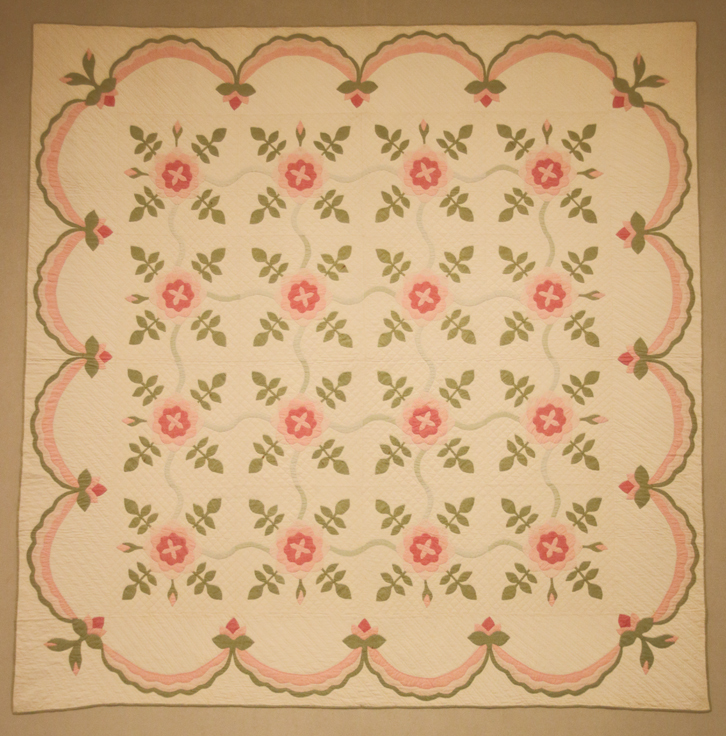 It will be in conjunction with an exhibit of Marie’s quilts in the textile department. 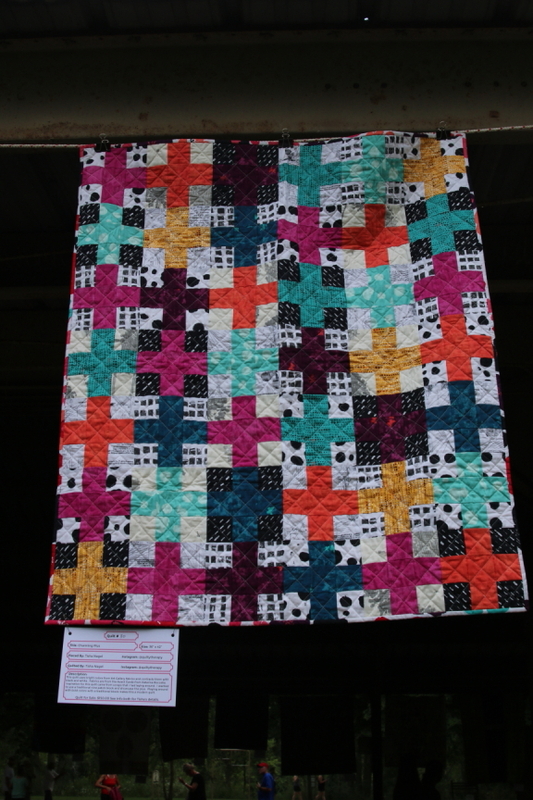 Every year SAQA has an auction of 12″x12″ quilts. 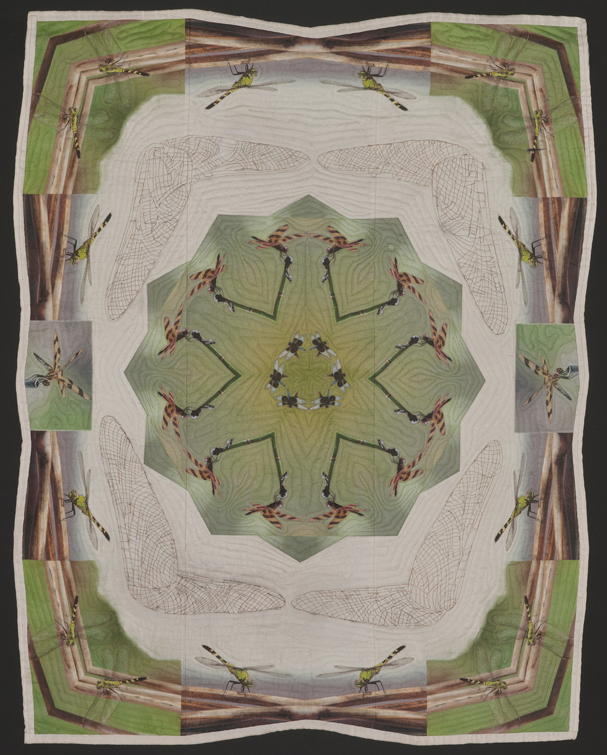 You can see my leather quilt: Bee Play II here. 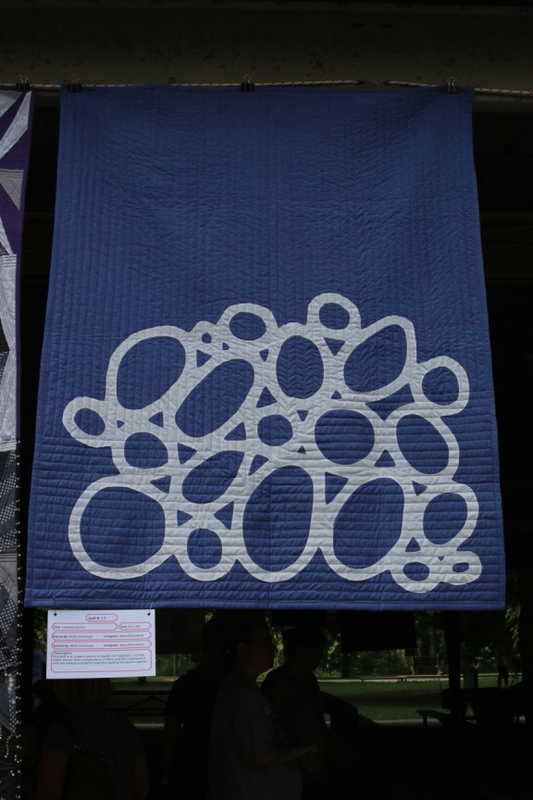 The quilt I donated last year now resides in Paris. 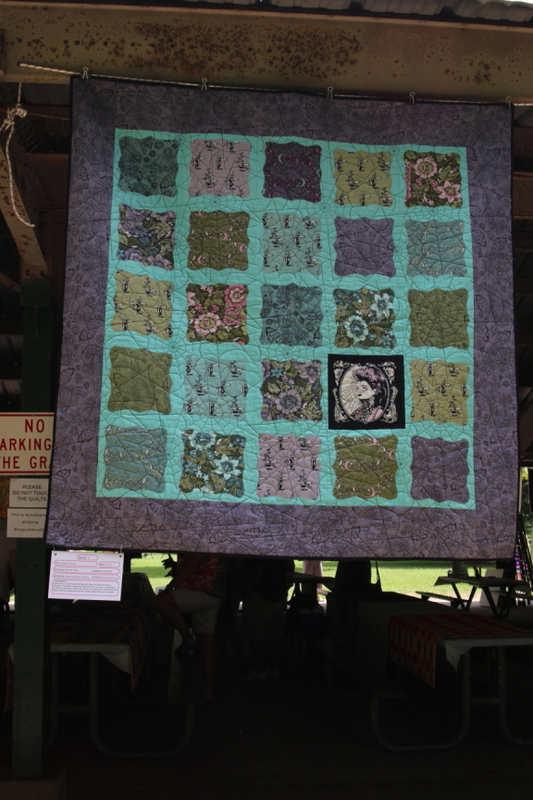 I hope my bee lands in another good home this year as both quilts have bees on them. I may need to continue that unintentional theme. 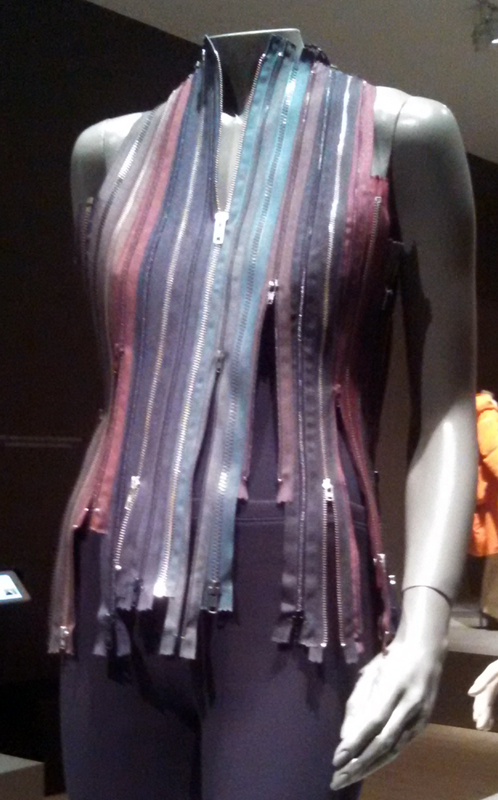 A zipper vest by Martin Margiela. 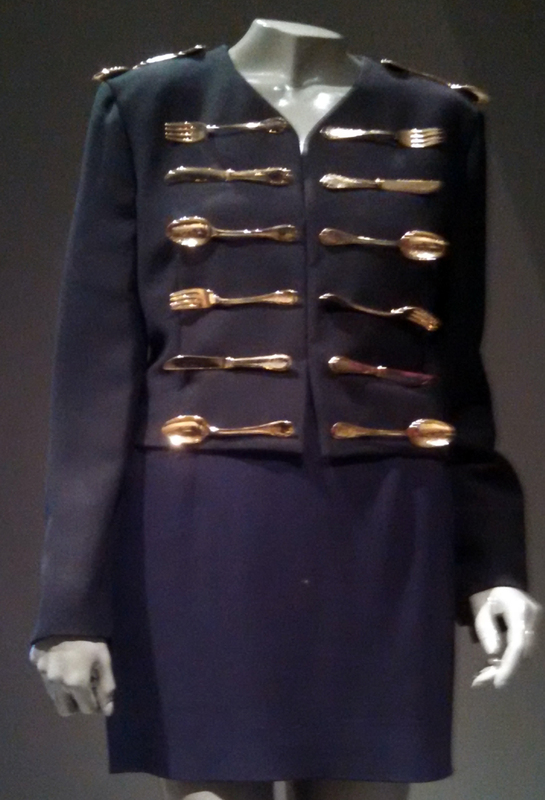 The clothing ranged from recycled, to paper, to satirical, to haute couture. They were all beautiful and all interesting. 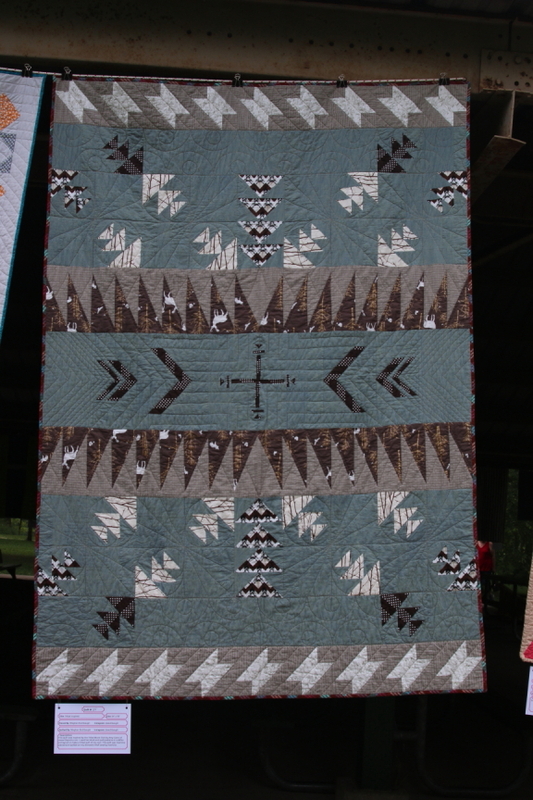 Here is a vest made from reused zippers. 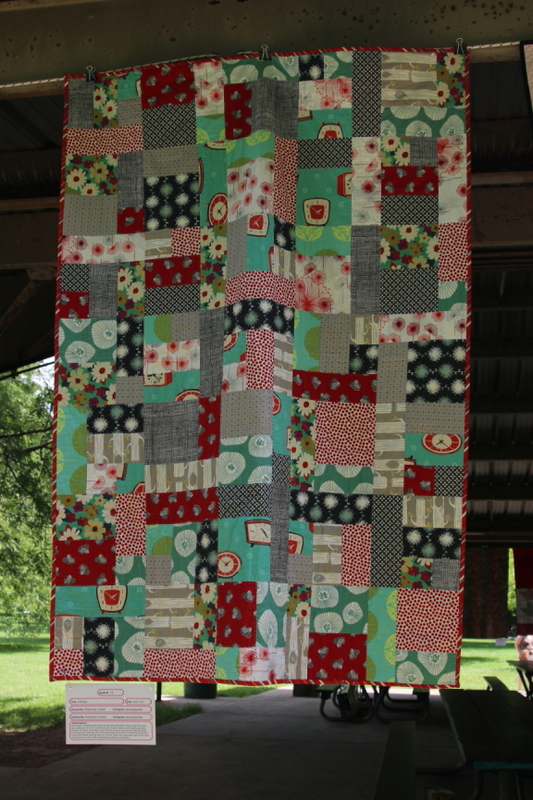 I know my daughter is going to love this one. 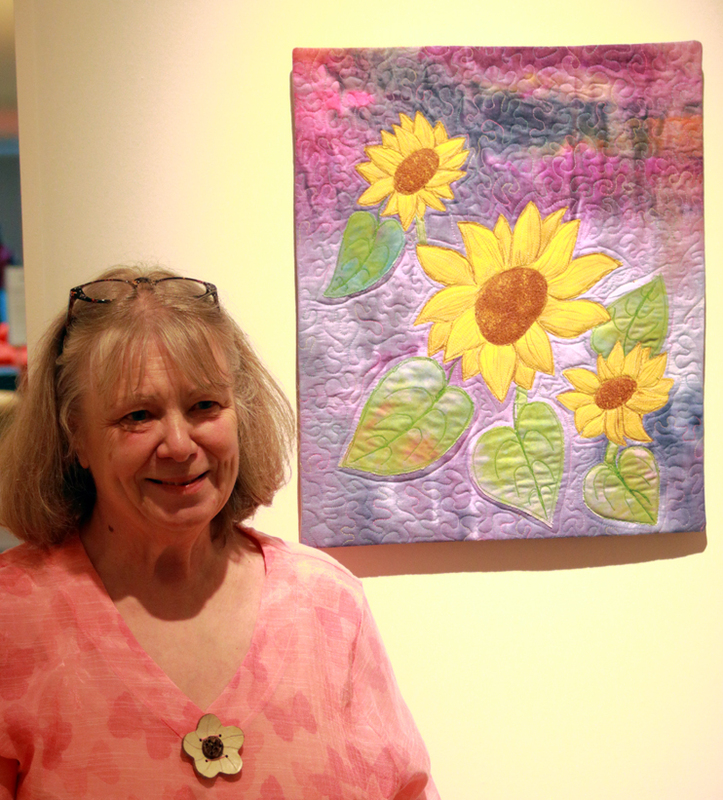 such as this hand painted and hand made dress by Zondra Rhodes that Niloo donated. 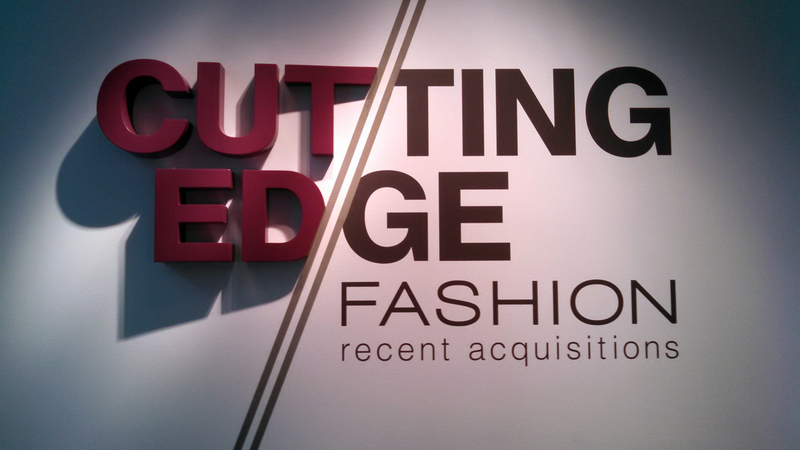 Museum of Art to see Cutting Edge. The pictures I shared here are just the tip of the iceberg. 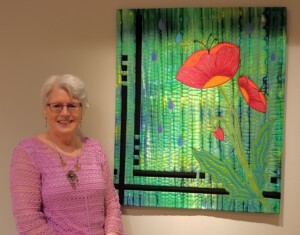 There are some others posted on my Facebook page Barbara Triscari, which is public, so you don’t have to friend me to just check out the pictures of the exhibit.